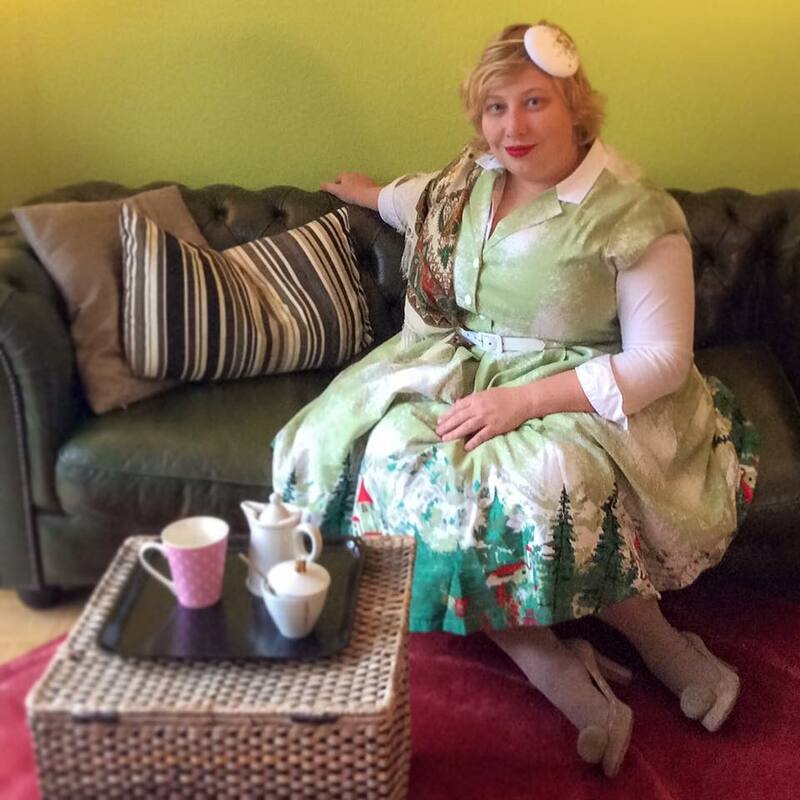 I love this dress – the rest of the year it is a stunning wiggle dress with sleeves. 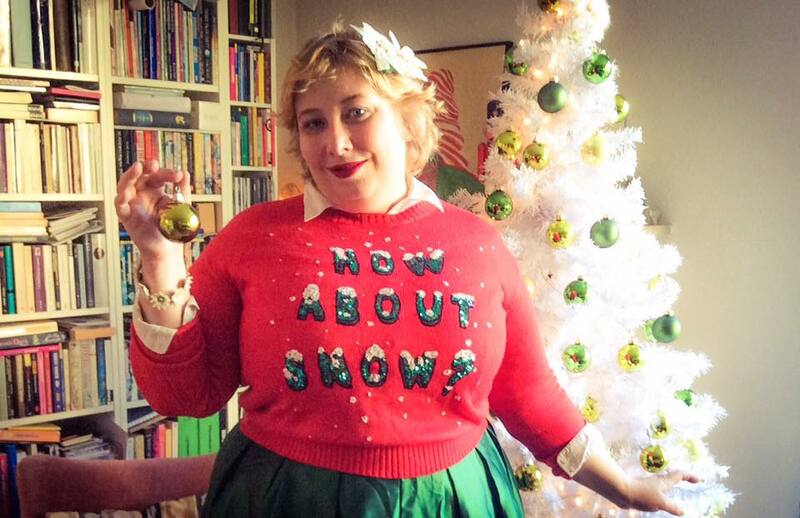 But in December I like to wear it with the white fake fur cuffs. 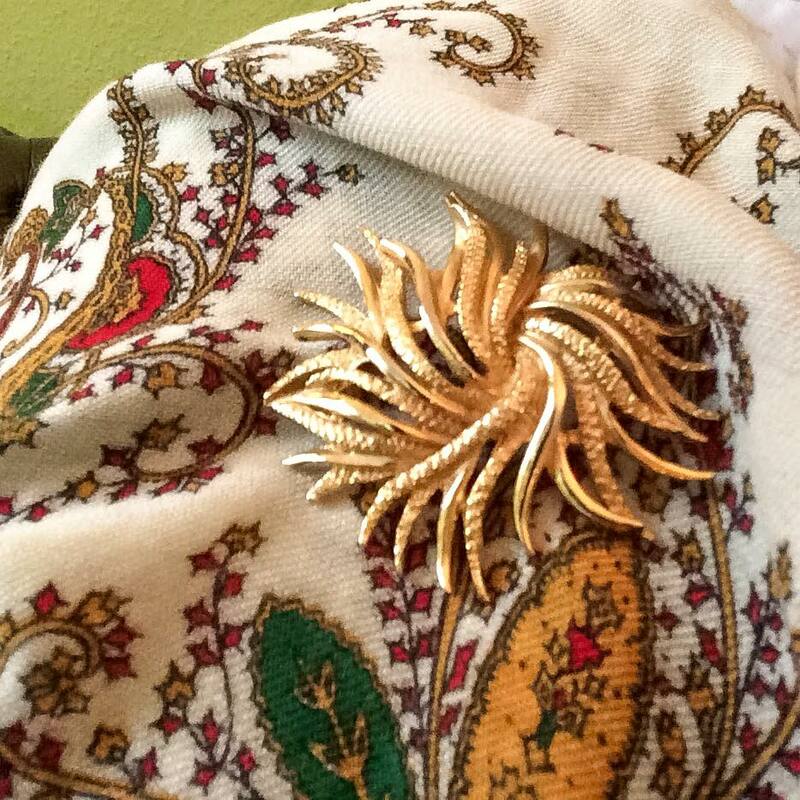 Without the fascinator I have worn it to two December council sessions – in 2014 and 2015. Unfortunately not this year – as I was sick that day. 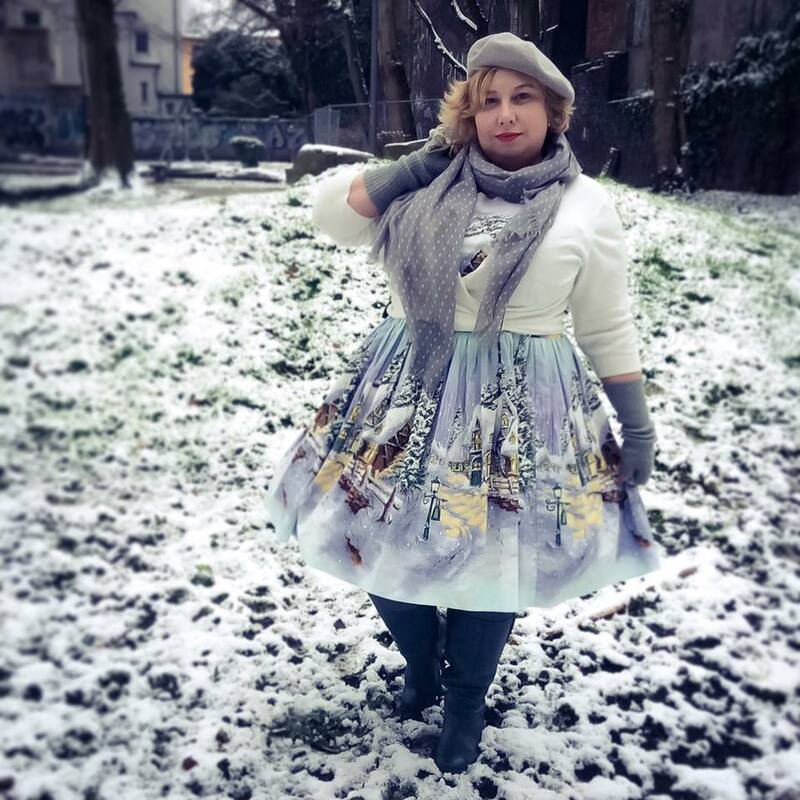 Ich liebe dieses Kleid – den Rest des Jahres ist das hier ein wunderbares Bleistiftkleid mit Ärmeln. Aber i Dezember trage ich es gelegentlich gerne mit den weissen Kunstfellmanschetten. 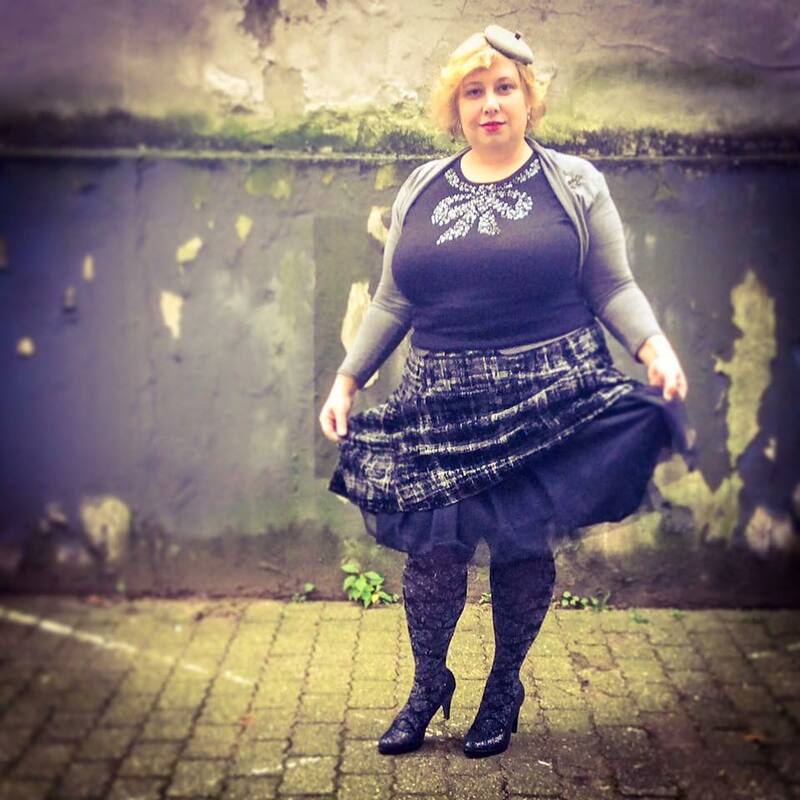 Ohne den Fascinator habe ich das Outfit so in der Art 2014 und 2015 zu den Ratssitzungen im Dezember getragen. Dieses Jahr leider nicht. Da war ich krank. 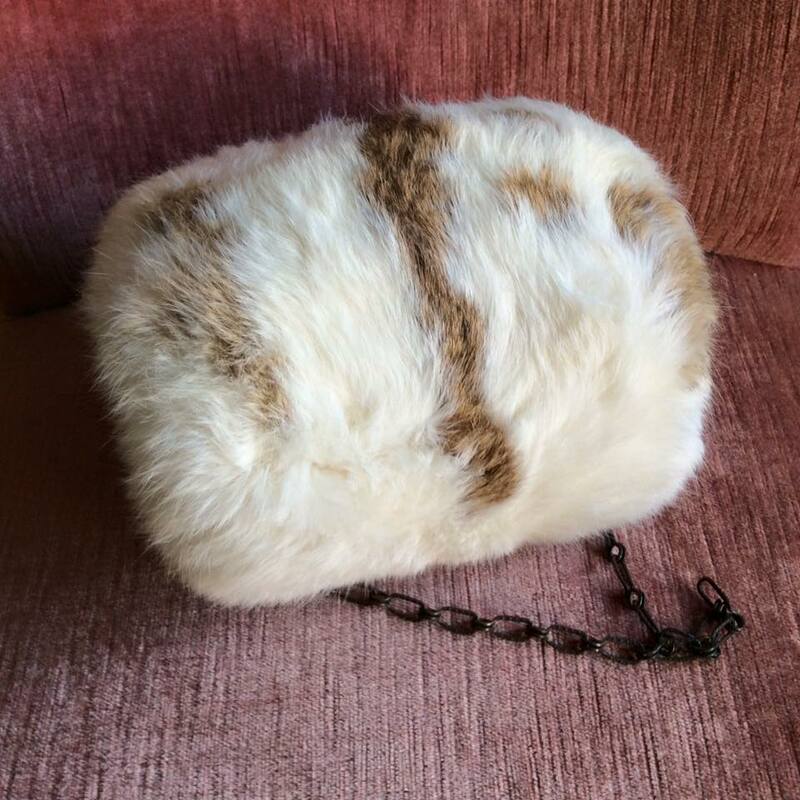 The fake fur cuffs were made from an old fur scarf that I got at a second hand shop. Die Manschetten aus Kunstfell sind aus einem alten Schal gemacht den ich in einem Second-Hand-Laden gefunden habe. The Clutch is from ASOS. Unfortunately the iPad very nearly doesn’t fit in. Bugger. But I didn’t sent it back because of that. Die Clutch ist von ASOS – leider passt mal wieder ganz, ganz knapp das iPad nicht hinein. Aber deswegen habe ich sie nicht zurück geschickt. This glitters and sparkles so much – this clutch will be a fun accessory for years to come! Das funkelt und glitzert so sehr – die Clutch wird ein tolles Accessoire für viele Jahre sein. 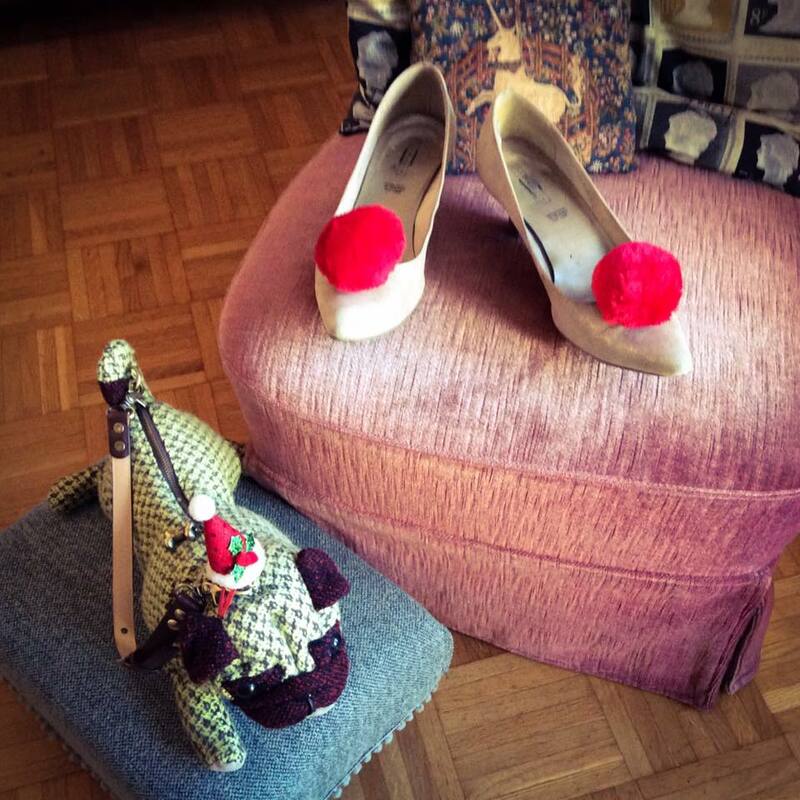 The little white mink fascinator feels really glam. It always reminds me a bit off powder puffs. 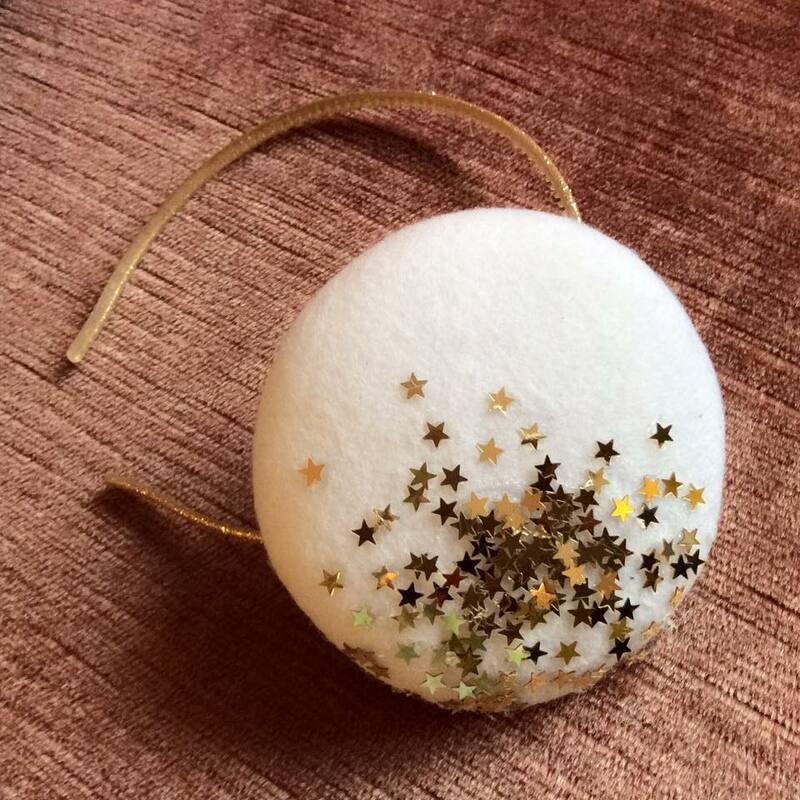 Der kleine weisse Nerzfascinator ist sehr glamourös und erinnert mich immer an eine Puderquaste. 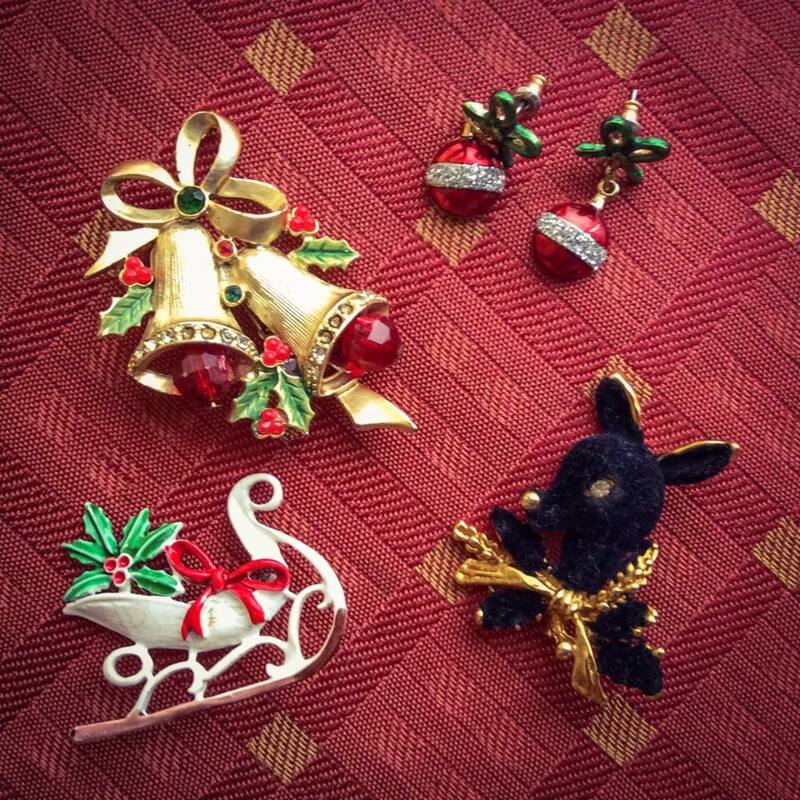 The earrings and the sleigh brooch are a good match. So far the only unworn bit is the black bambi. Die Ohrringe und die Schlittenbrosche passen sehr gut zusammen. Bis jetzt ist das einzige, dass ich noch nicht in dieser Weihnachtszeit getragen habe das schwarze Bambi. 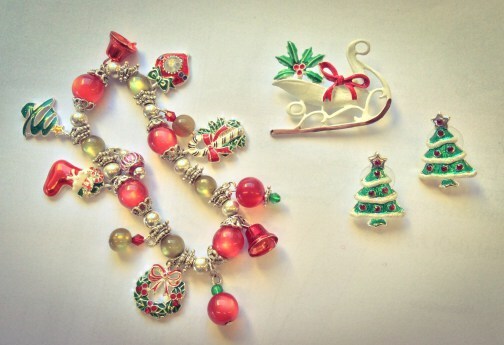 The charm bracelet is a long time favourite – I think I got it back in 2004 – together with the Christmas tree earrings. Das Bettelarmband ist schon seit ca. 2004 ein Favorit zur Weihnahtszeit – zusammen mit den Tannenbaum-Ohrringen. Looks quite glam without the scarf. Ohne den Schal ist das Kleid sehr mondän. 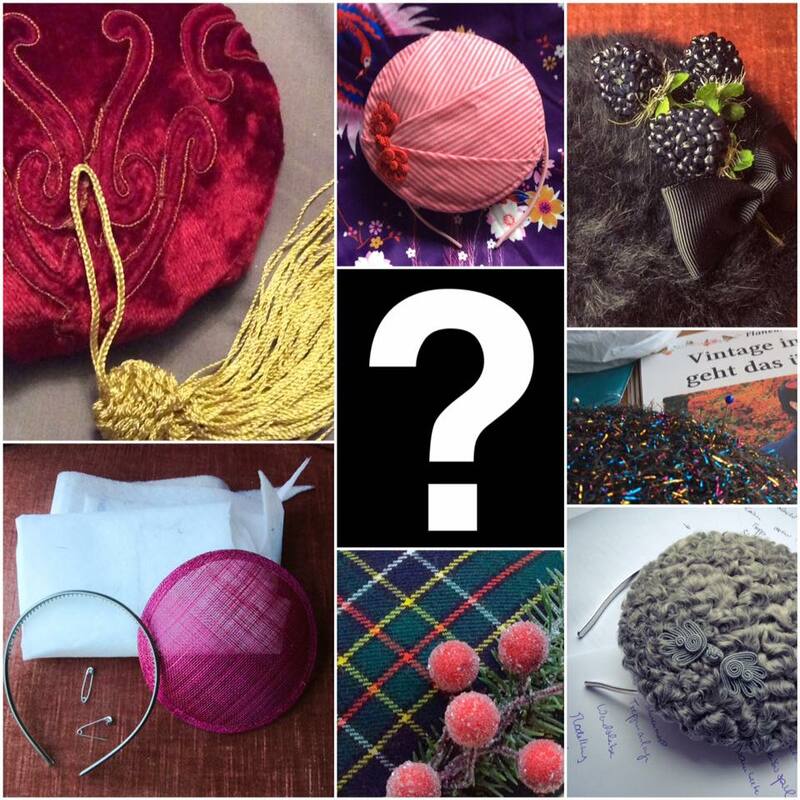 Lucky winner for the #MakeMyFascinator is Tatjana M. – you got mail! 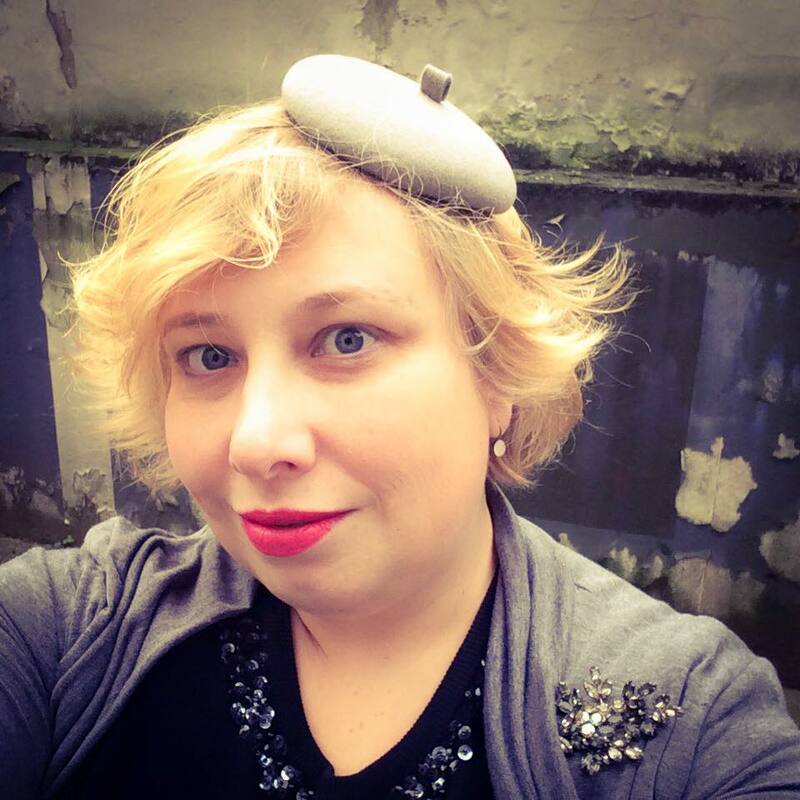 Die glückliche Gewinnerin für #MakeMyFascinator ist Tatjana M. – du hast Post! 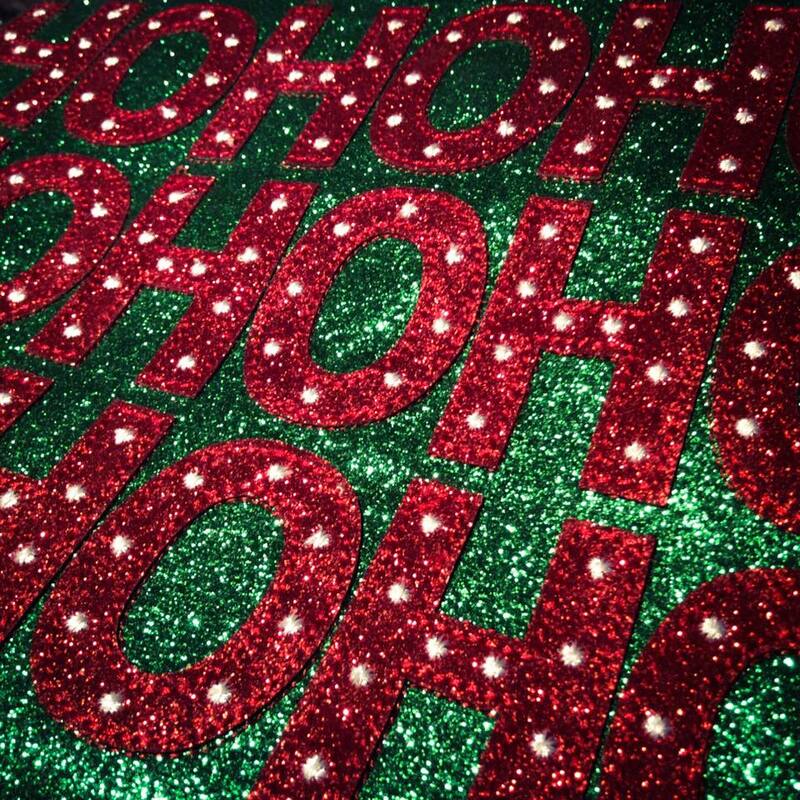 Only a few more days till Christmas. On Thursday we have out office Christmas party. The pics for the outfit are already taken. 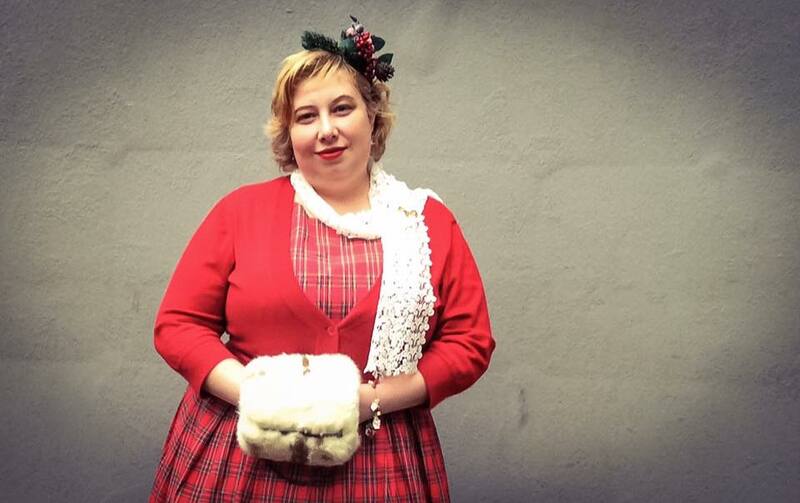 My final festive outfit for the year will be on Christmas Eve. Nur noch ein paar Tage bis Weihnachten. Am Donnerstag haben wir noch unsere Büro-weihnachtsfeier. 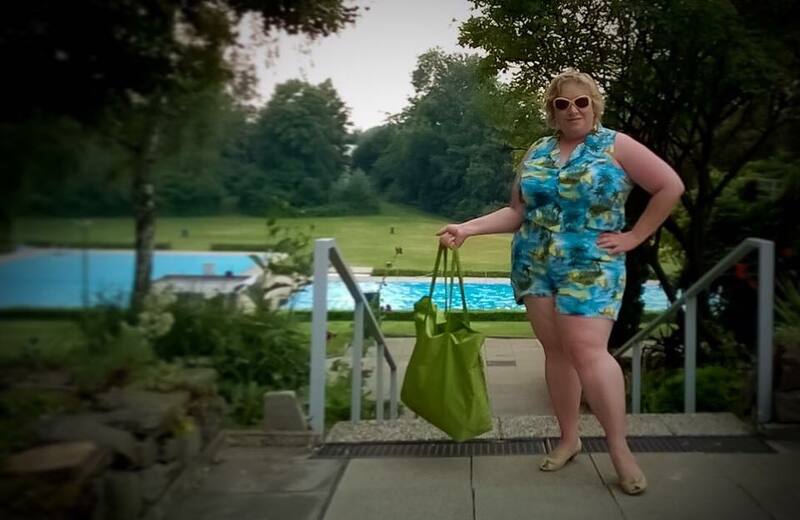 Die Bilder für das Outfit haben wir schon aufgenommen. 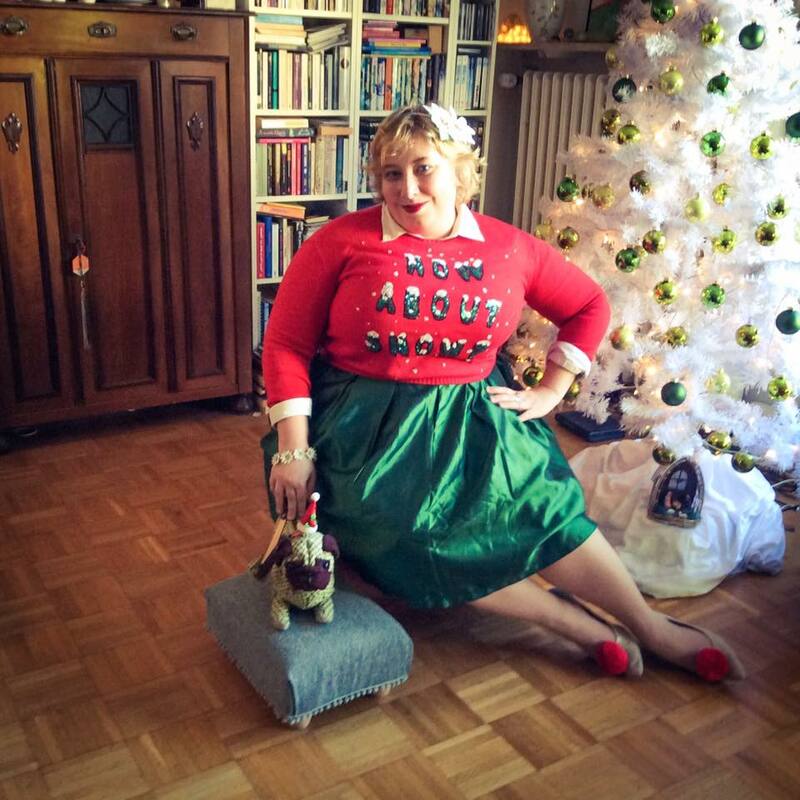 Mein letztes weihnachtliches Outfit poste ich zu Heiligabend. Un autre mois est passé et c’est encore le temps pour le French Curves. En décembre c’est toujours un peu glamoureux. Aujourd’hui le thème est métallique. Ahhh. 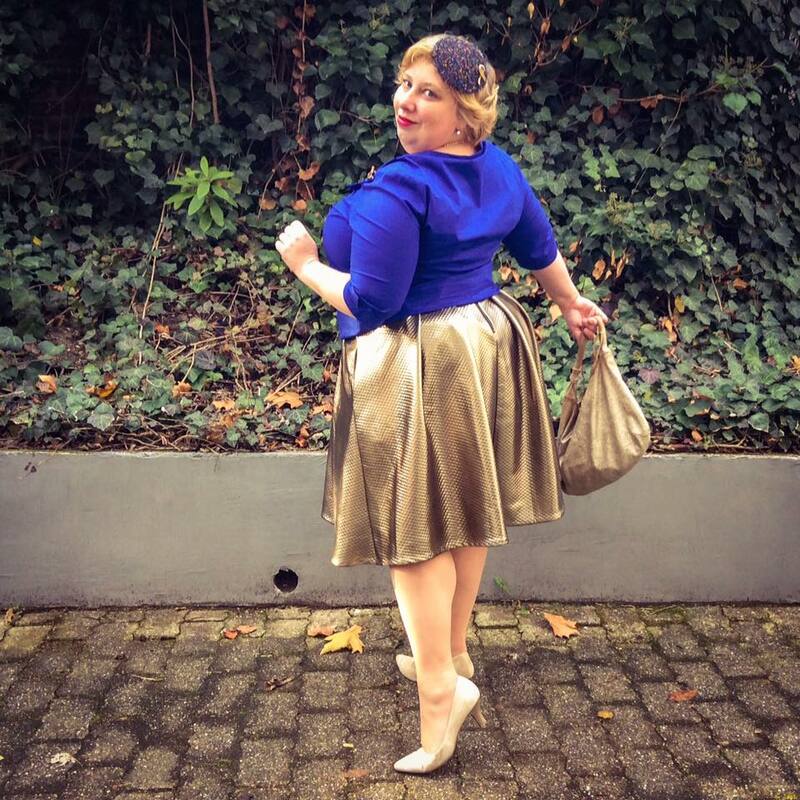 J’ai pensé à la jupe d’or d‘Elli de Curvyfashionelli. Et elle m’a la louée. Ces jours je l’achète moi-même. 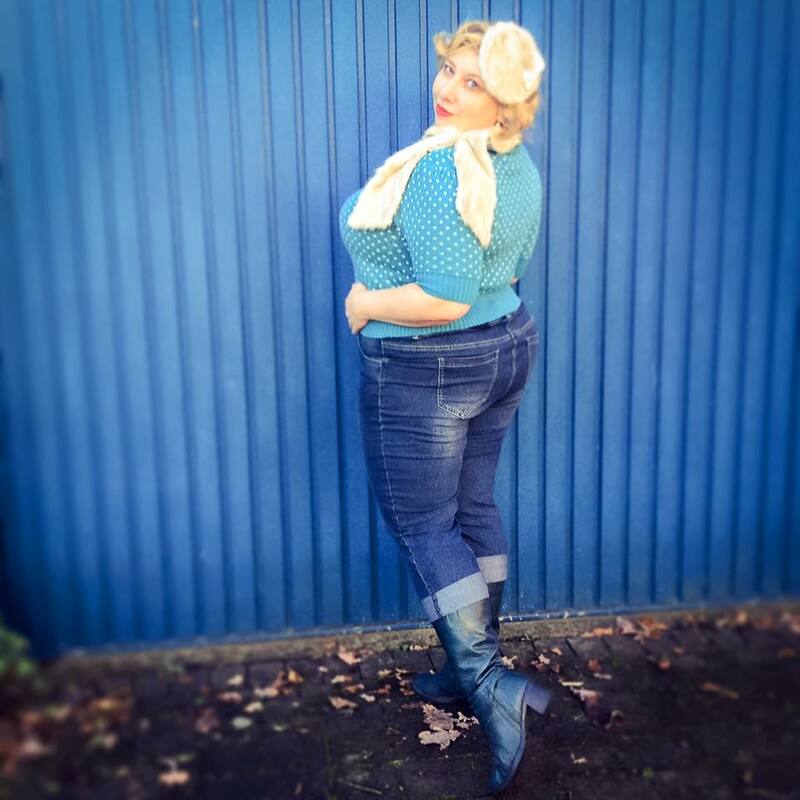 Another month has passed and it is time again for the French Curves. 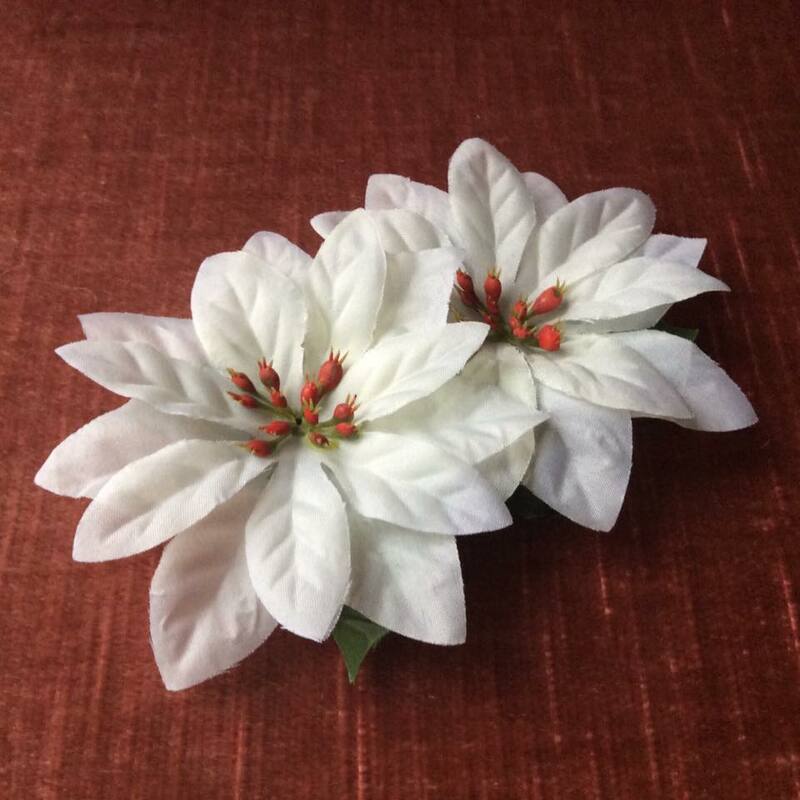 Every December it is a bit more glamorous. Today the theme is metallic. Awwwwww. 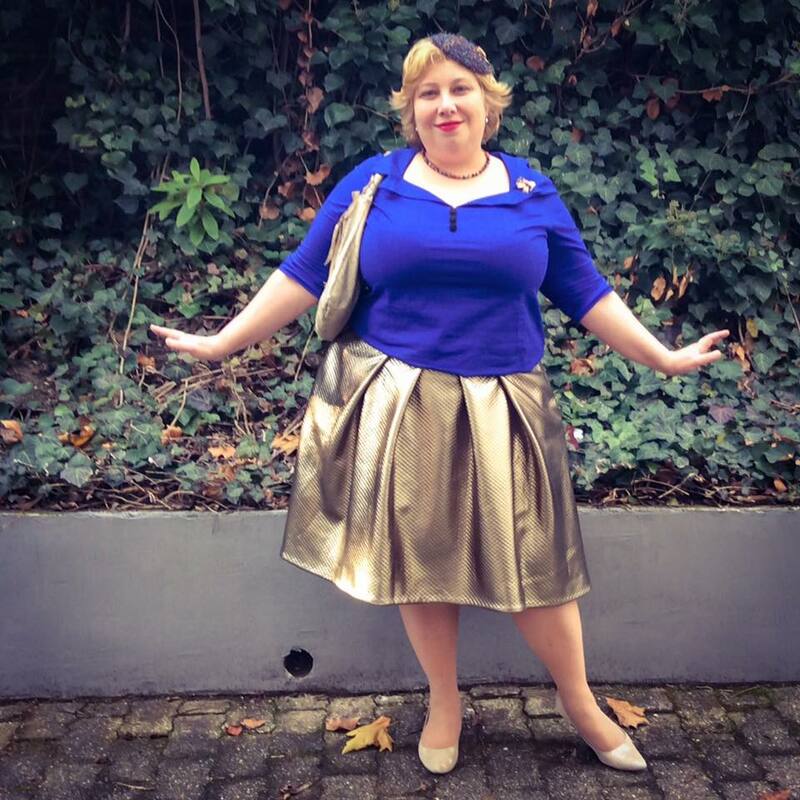 I thought right away about the golden skirt deom Elli from Curvyfashionelli. And she lend it to me. These days I got my own one. 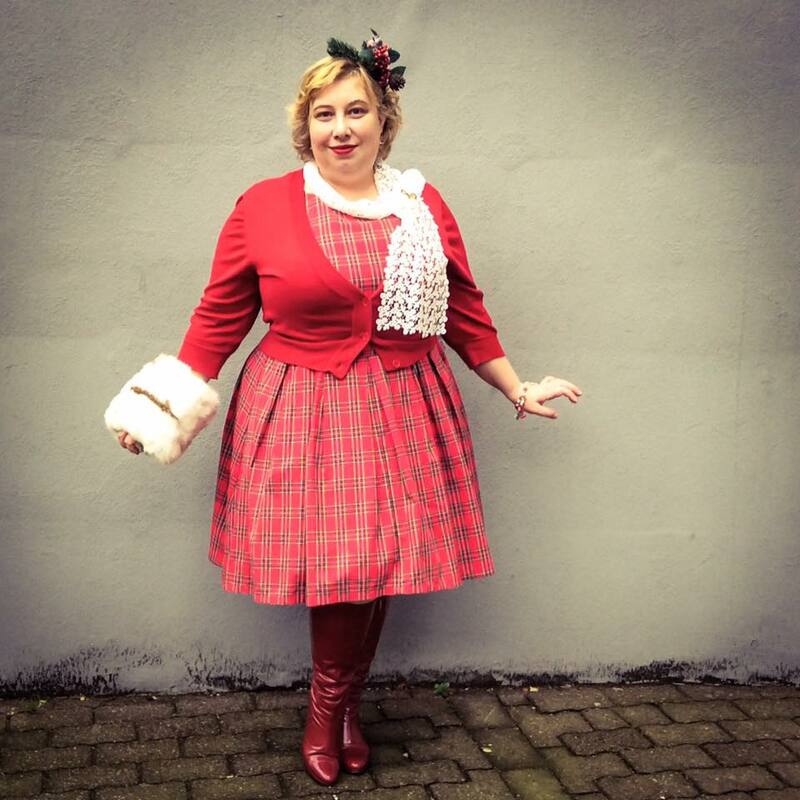 La jupe est très bien pour Noël, les fêtes et le nouvel an. Elle est super glam. 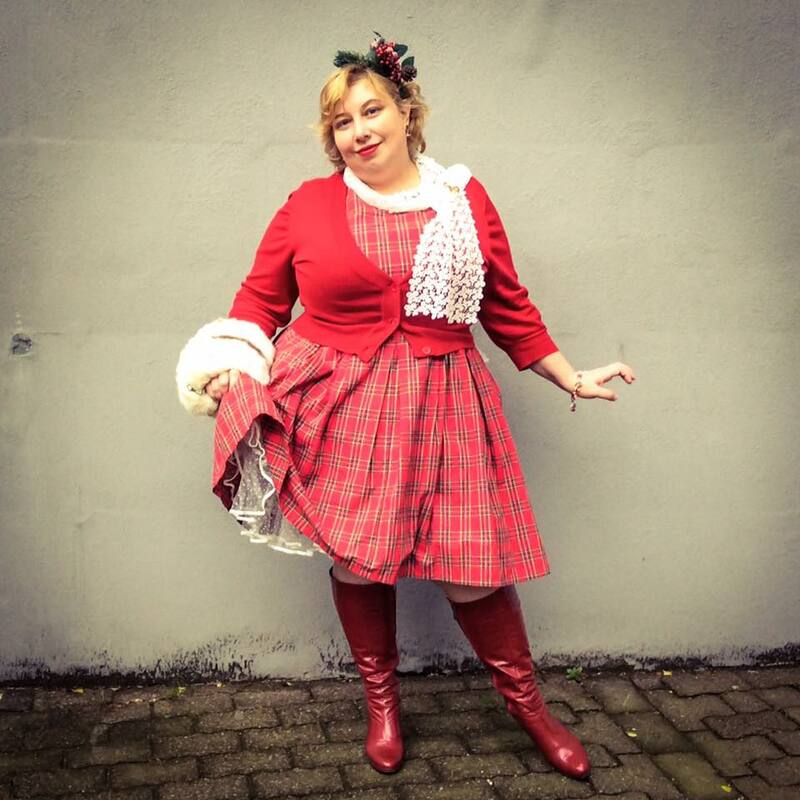 Le décembre est pour moi un mois avec beaucoup des occasions pour la mode festive . Et ça me plaît beaucoup. 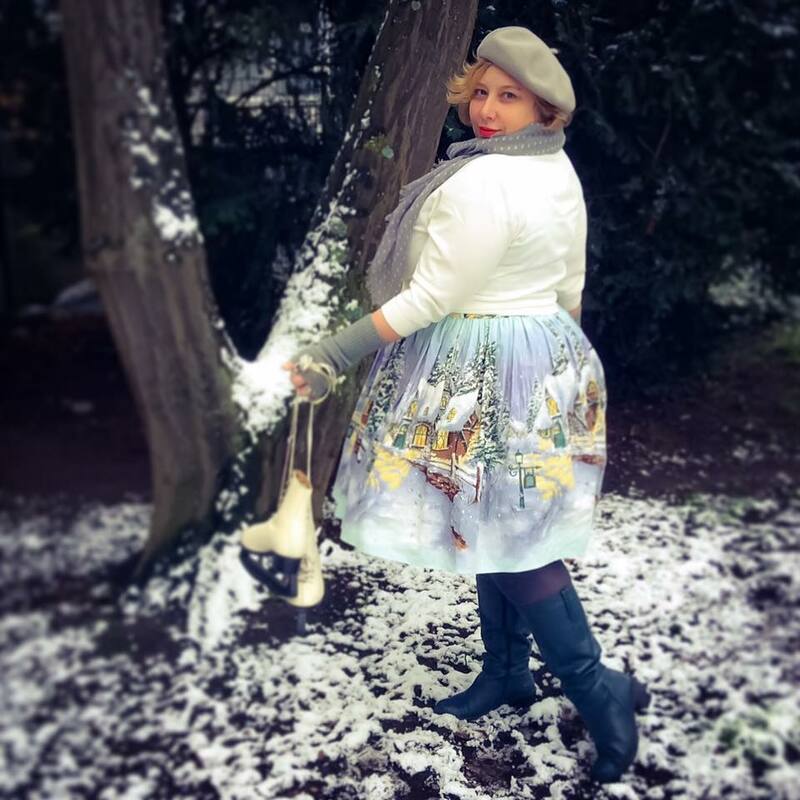 The skirt is excellent for Christmas, parties and New Year’s Eve. It is super glam. December is for me a month with plenty of occasions for party wear. And I really like that. Aussi c’est un de nous deux mois les plus sombres dans l’année. Les lumières pour Noel m‘ aide beaucoup. Le janvier est pour moi le plus dur. Mais encore on a les lumières. Et cette jupe est lumineuse aussi. It is also one of the two darkest months of the year. The Christmas lights help me a lot with that. January is the really tough month. But for now there are the lights. And that radiant skirt. Le fascinateur est de l’année dernière, faites pour le nouvel an. The fasinator is from last year – made for New Year’s Eve. La jupe d’or est matelassé. Laqualite est bien et lourd. 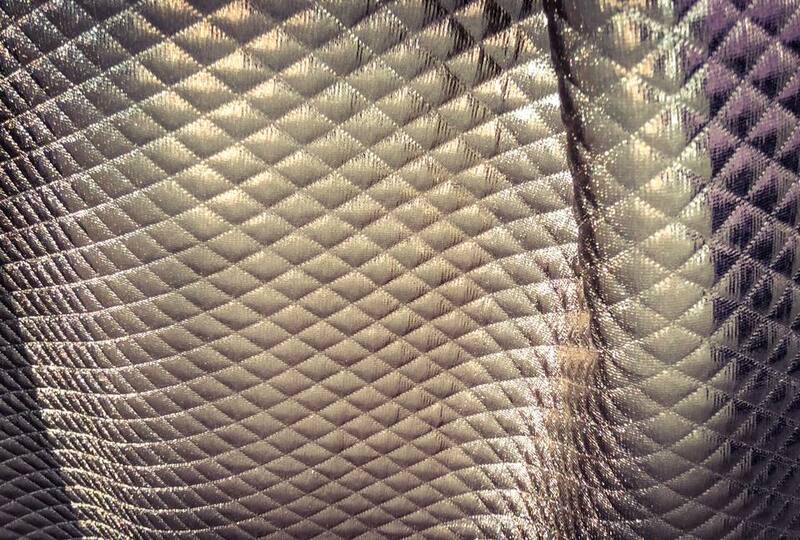 The golden skirt is quilted. The quality is nice and heavy. Un bon alternative pour celebrer le Nouvel Ans est ce sac a main. 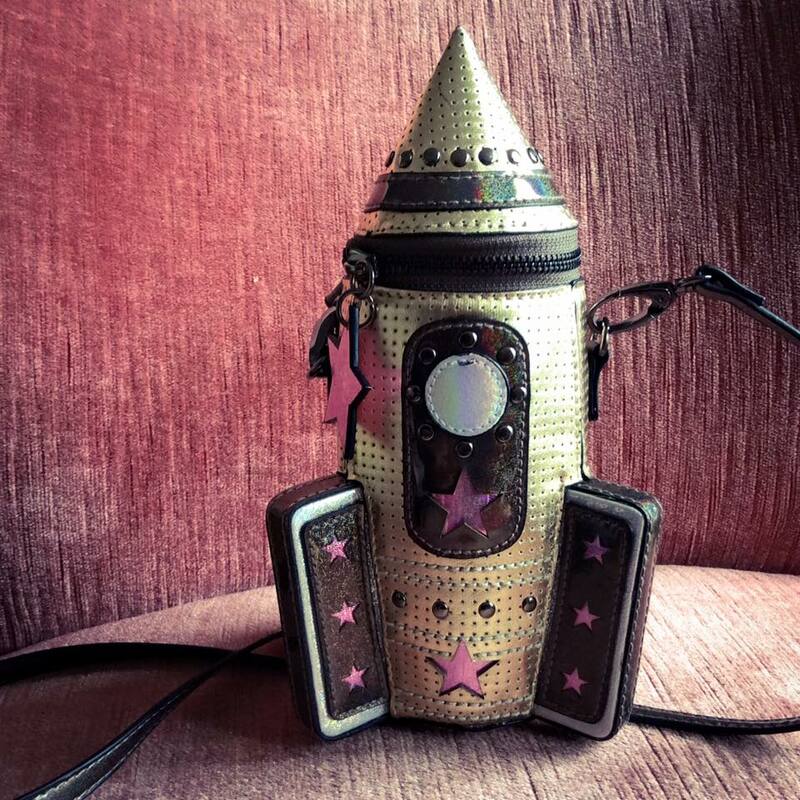 A good alternative to celebrate New Year’s Eve is this dinky handbag. Aussi chouette est ce manteau en jaquard metallique. Also great for the theme would have been this metallic brocade coat. 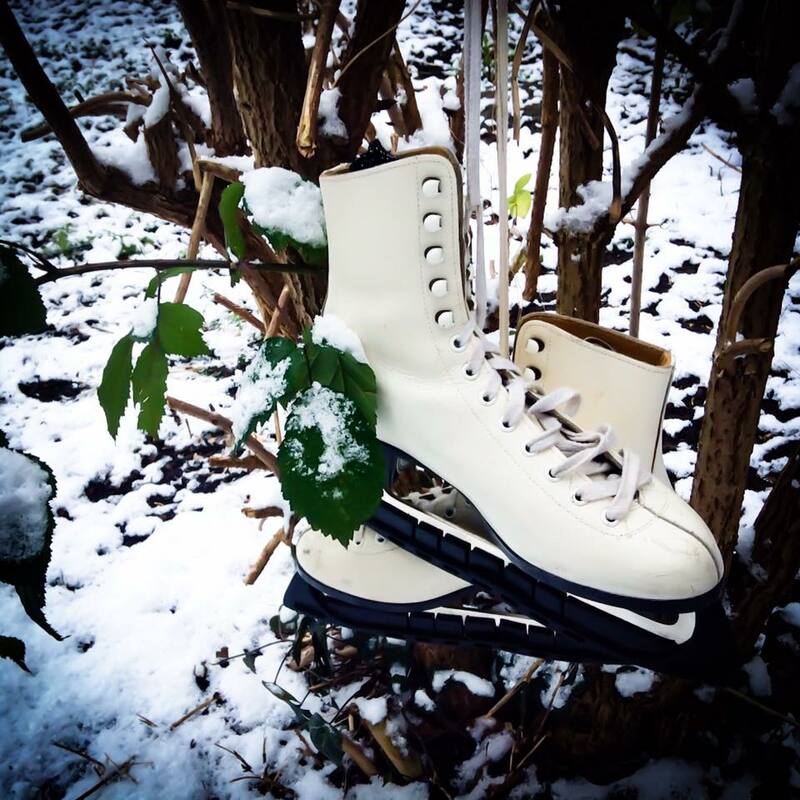 Let it Snow – Winterwonderland again! 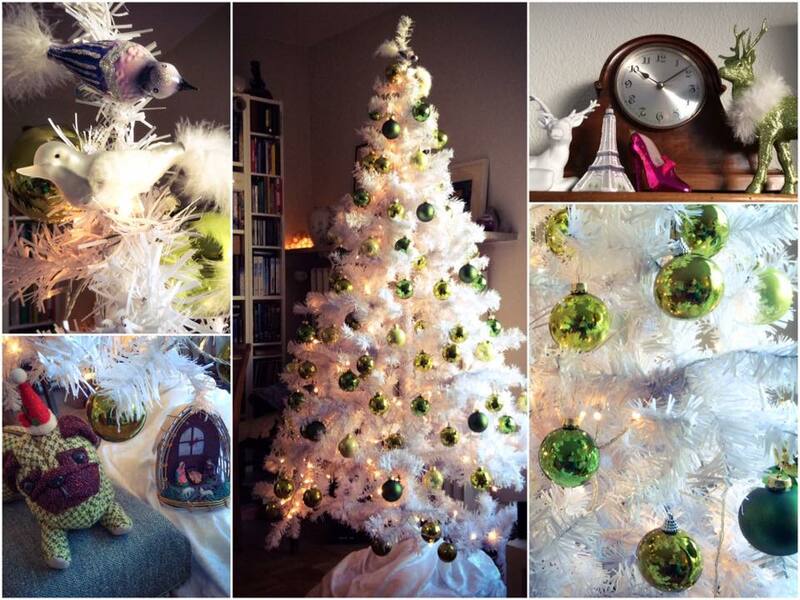 Winter or rather Christmas is coming! 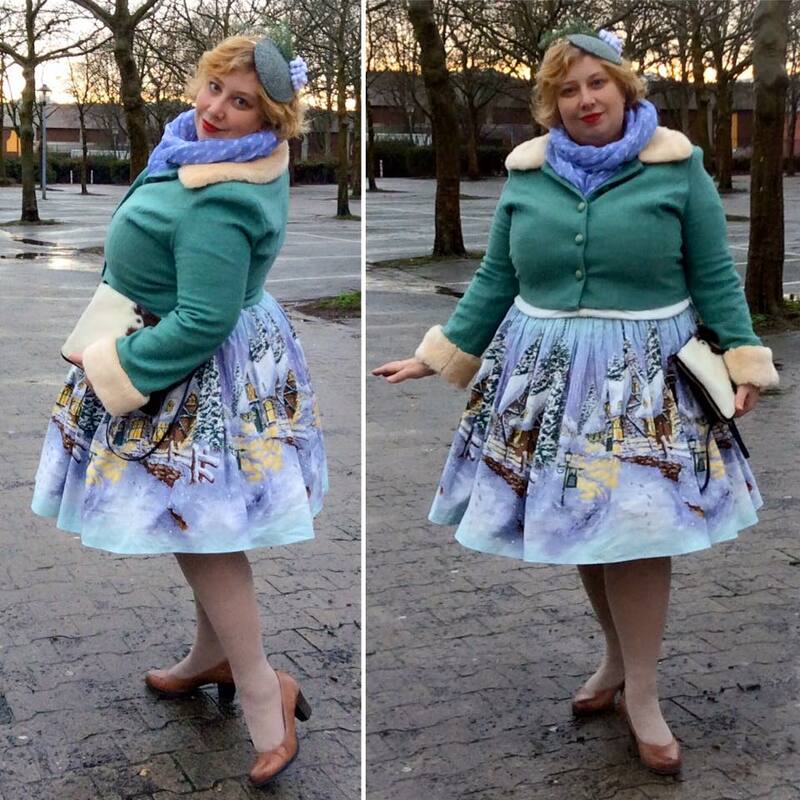 Time to get Bernie Dexter’s winter-wonderland dress out again. I do love the idea of seasonal dresses. Tropical prints in summer, a golden riot in Autumn – and now dreaming of a white Christmas with this pin-up fairytale beauty. Der Winter kommt – oder besser Weihnachten naht. 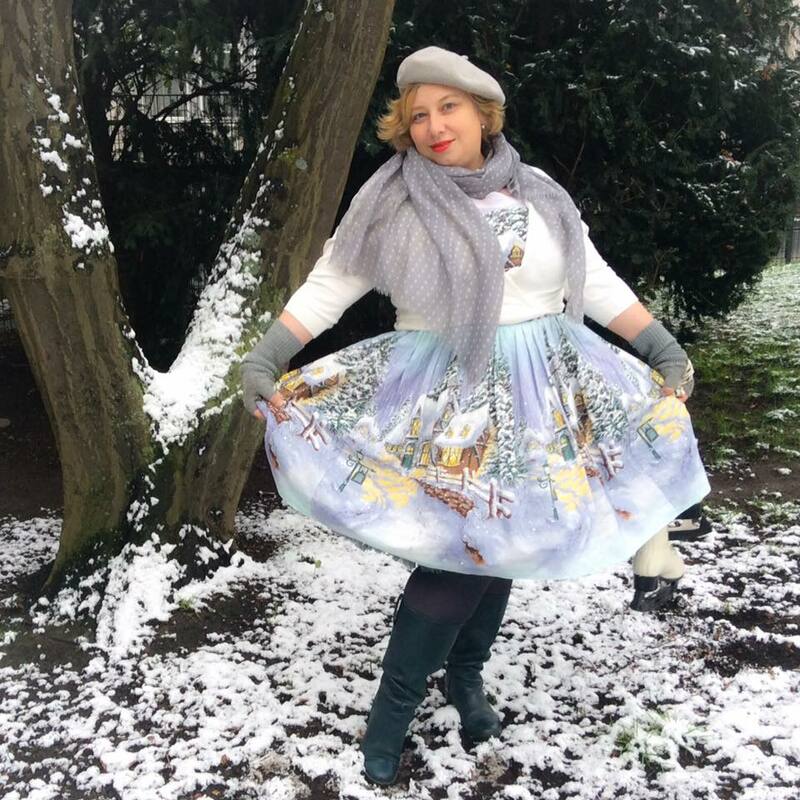 Genau richtig um wieder das Winterzauber-Kleid von Bernie Dexter herauszuholen. Ich bin ein großer Fan von Mustern, die auf die Jahreszeit abgestimmt sind. 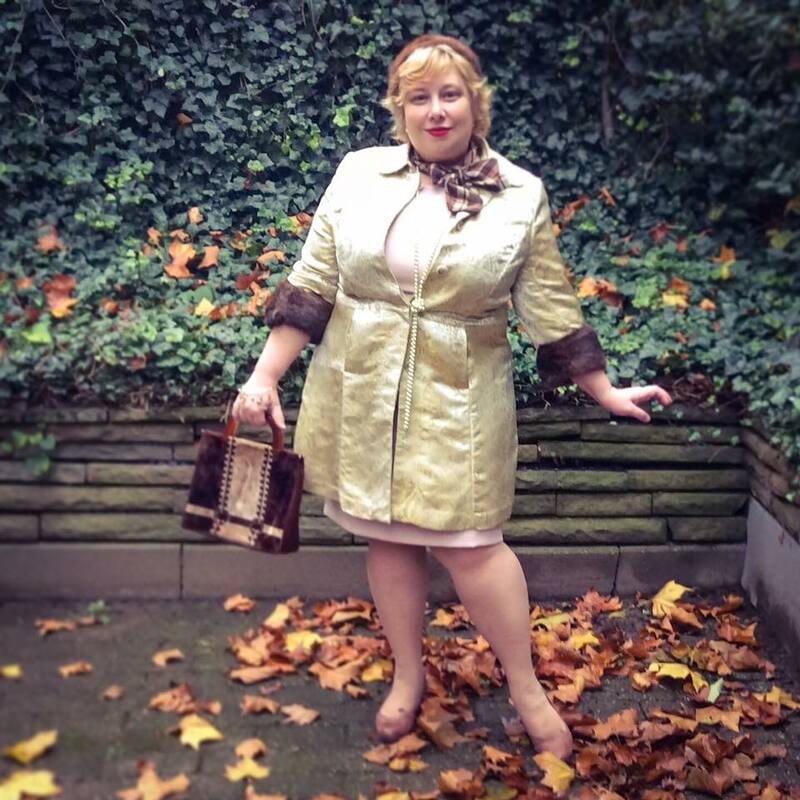 Tropische Prints im Sommer, ein goldener Wald im Herbst und jetzt ein Wintermärchen mit diesem Pin-Up Kleid. The pics are from February. One of the few days with a tiny bit of snow. This winter won’t probably be as mild. 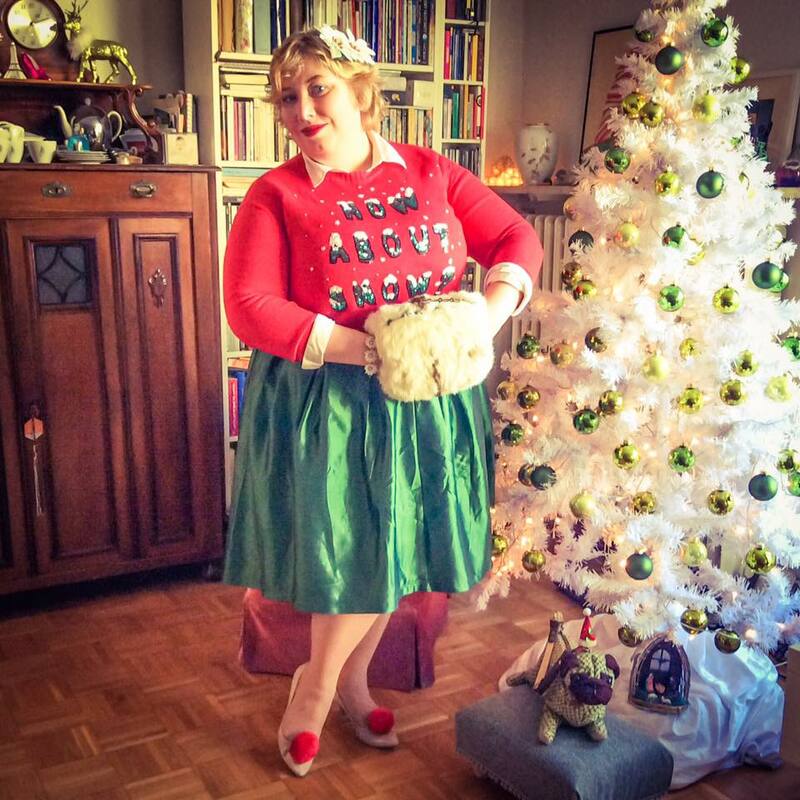 Last year you saw this dress on my blog for Curvy Christmas. 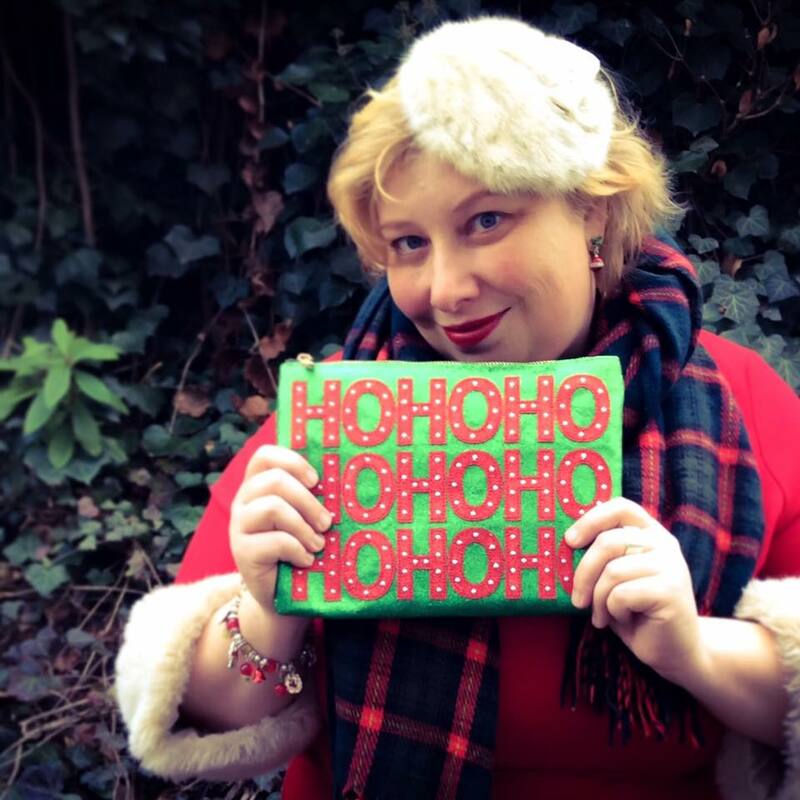 Curvy Christmas is a German plus-size advent calendar and New Year’s Eve countdown and starts today on Jana’s Blog Plussize by Nature. My day is next Wednesday, on December 7th. Die Bilder haben wir im Februar gemacht. An einem der wenigen Tage mit Schnee im letzten Winter. Dieser Winter wird wahrscheinlich nicht so mild. 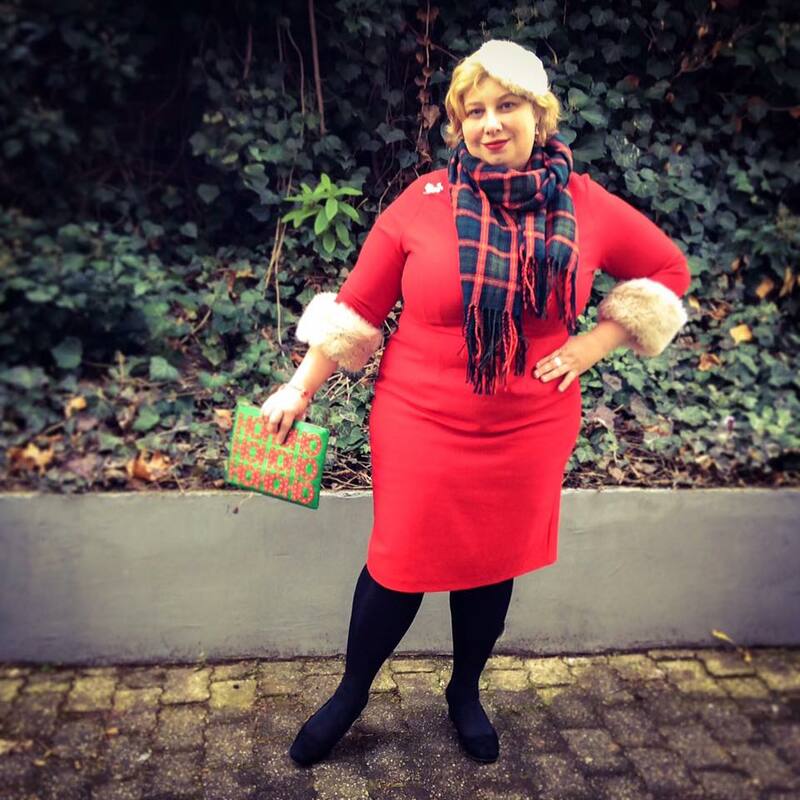 Schon letztes Jahr gab es dieses Kleid auf meinem Blog für Curvy Christmas zu sehen. 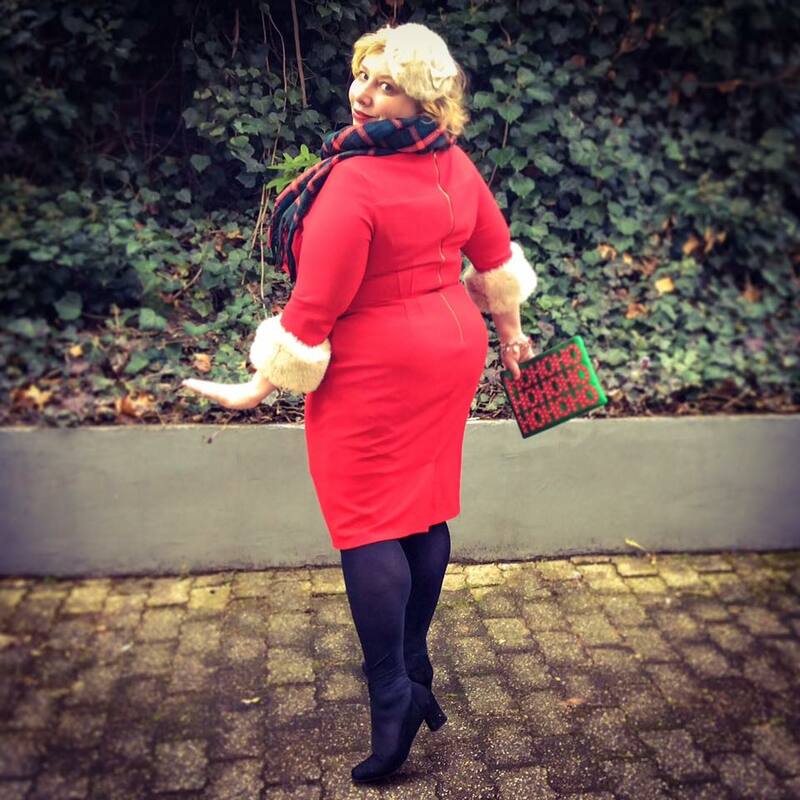 Curvy Christmas ist ein deutscher Plussize Adventskalender und Silvester Countdown . 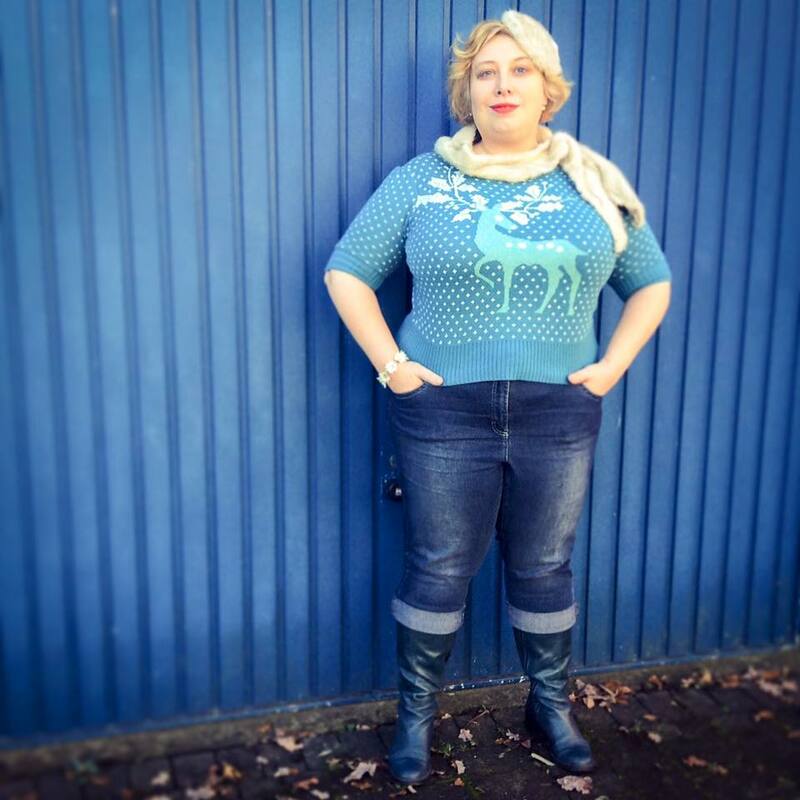 Heute geht es auf Janas Blog Plussize by Nature los. Mein Türchen öffnet sich am nächsten Mittwoch, dem siebten Dezember. As much as Christmas markets have a tendency to annoy me – well I do live right in the city centre and ours is rather spread out. Which is charming. Unless you are in a hurry and a trifle late. Zig zagging around people in strolling mode isn’t fun. However I do love a good mulled wine, roasted chestnuts, Bratwurst and toasted almonds. So sehr wie mich Weihnachtsmärkte schnell nerven – ich wohne in Bochum mitten in der Stadt und unserer geht einmal quer durch die Stadt. Eigentlich sehr charmant. Es sei denn man muss Dinge erledigen und hat es eilig während der Rest um einen herum im Schlendermodus ist und alle Zeit der Welt hat. Aber auch ich mag einen guten Glühwein, heiße Maronen, Bratwurst und gebrannte Mandeln. I am very tempted to wear this dress to the conservatives Christmas party. It starts with a walk-in advent calendar. No clue what that is. But we were told it’s outdoors, there will be carolling (trust me you don’t want to hear me sing) and if capable people should bring a musical instrument. Everyone there and within hearing range can count themselves lucky we sold my violin ages ago. I was never very good and on bad days it sounded like someone torturing a cat. Anyway – I can always look the part. Like a Christmas angel. Silent night! 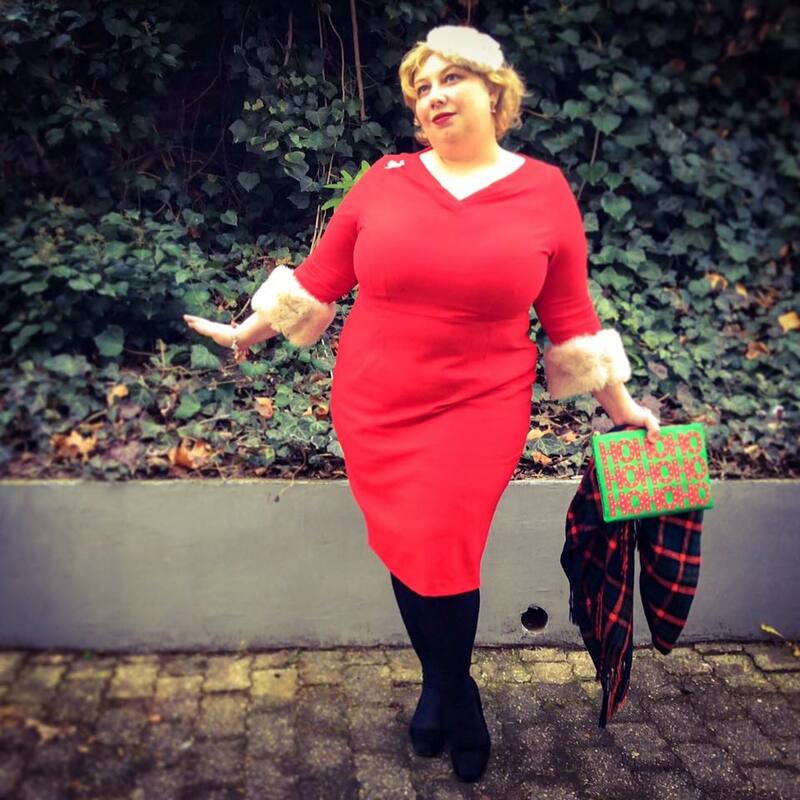 Ich bin sehr versucht dieses Kleid zur Weihnachtsfeier der CDU-Fraktion anzuziehen. Wir beginnen dieses Jahr mit einem begehbaren Adventskalender. Was auch immer das ist. Es ist wohl draußen, wir werden singen (und glaubt mir, mich will keiner singen hören) und wer (es spielen) kann, soll ein Instrument mitbringen. Zum Glück für alle Beteiligten ist meine Geige schon lange verkauft. Ich war darin nie wirklich gut und an schlechten Tagen klang es verdächtig nach gequälter Katze. stille Nacht hat auch was für sich. 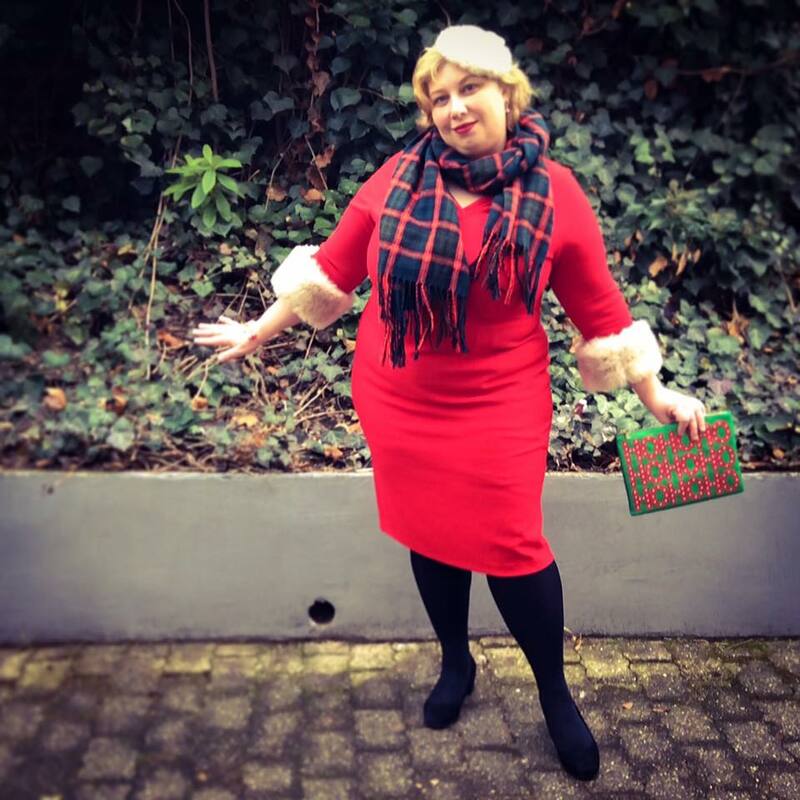 Anyway – wenigstens kann ich was passendes Anziehen: bei dem Outfit werden selbst Weihnachtsengel neidisch. „Photoshop“: yes – I was a bit trigger happy on the filters for this one, especially the glow/ clarity! 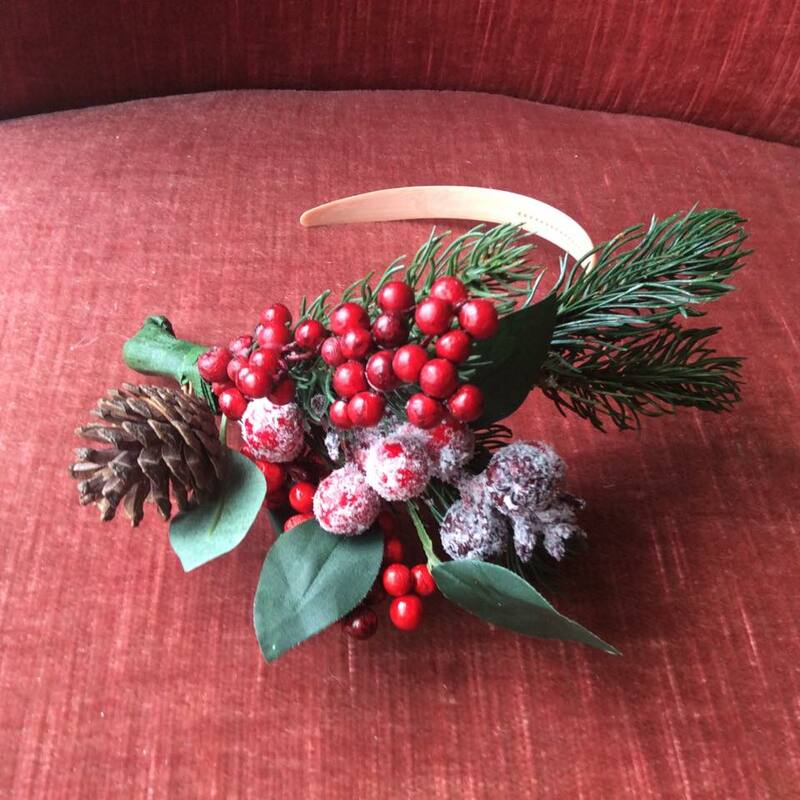 This month’s theme for Modejahr2016 (fashion year) from Ines Meyrose is Winter Colours – colours of nature matching the season. On Ines Meyrose’s page is the full blog parade (in German) . „Winterfarben – Farben der Natur passend zur Jahreszeit. 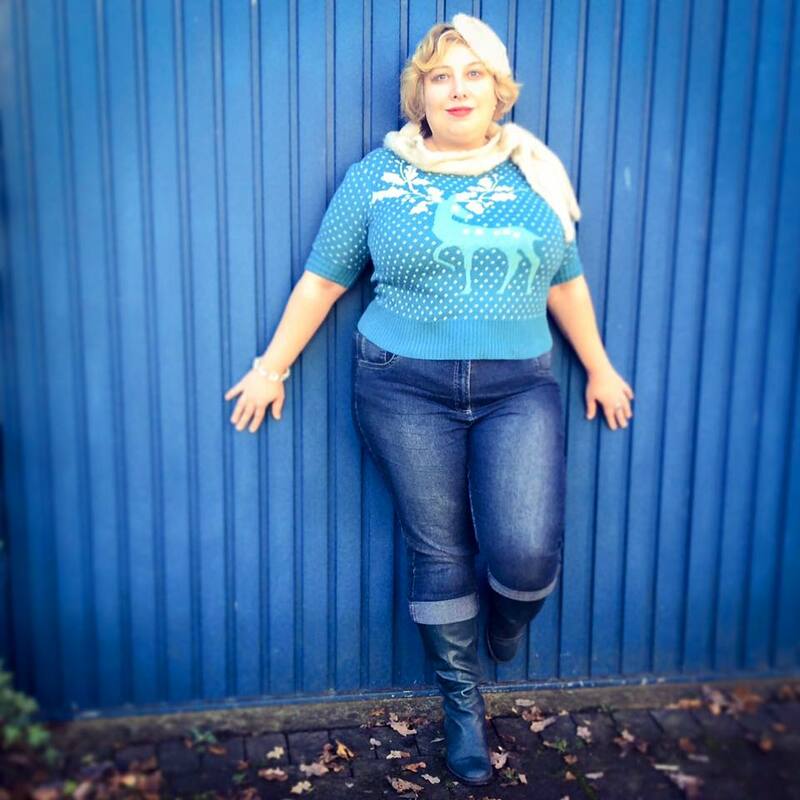 Kalendarisch oder zum Farbtyp“ ist diesen Monat das Thema bei Ines Meyroses Modejahr2016. Wenn das nicht wie die Faust aufs Auge passt! 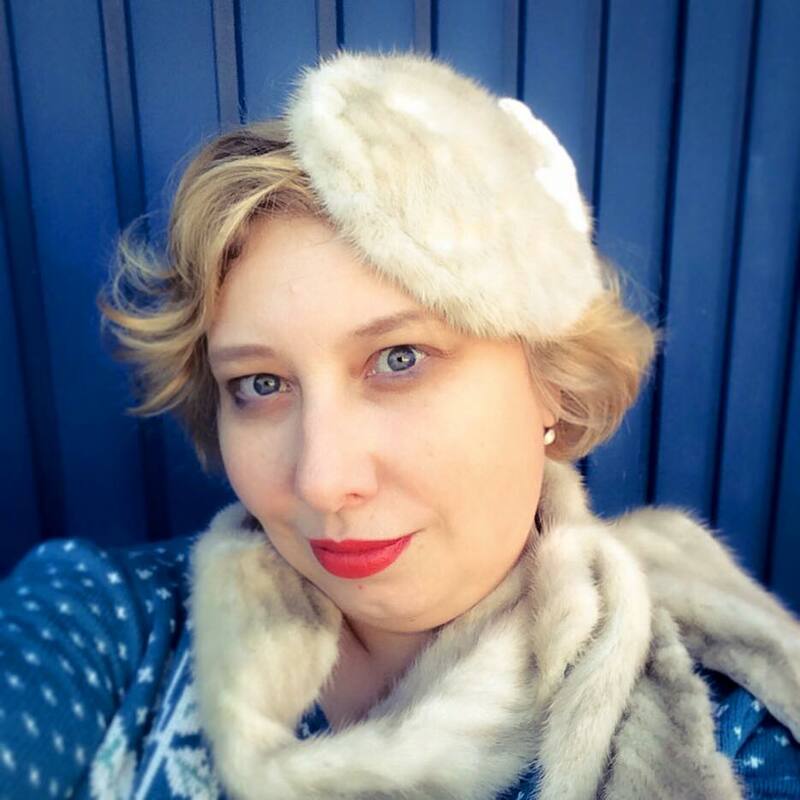 Auf Ines Seite gibt es die Blogparade zu den Winterfarben. 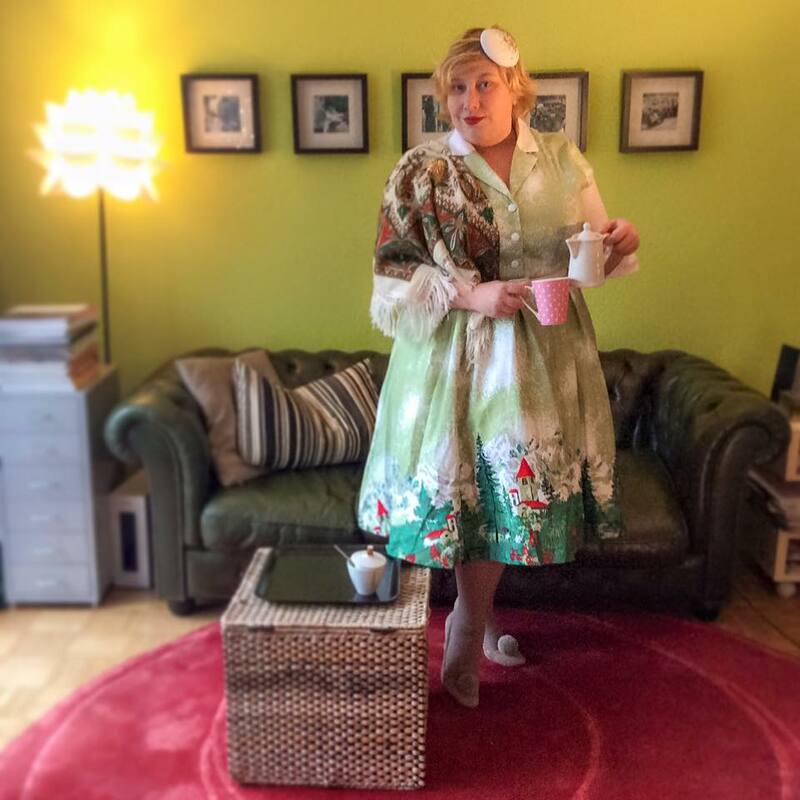 Ok, though this winter is lacking somewhat around here in cold temperatures – it is time to post this wonderful jacket by Collectif Clothing. I promised that to Froilein Olivia some time ago. Marianne is part of a suit and Hackey Rose’s blogpost is to die for – she has this in pink though. Though I love pink, I thought it would be too sweet and I got this set in green for silly money in the sale. 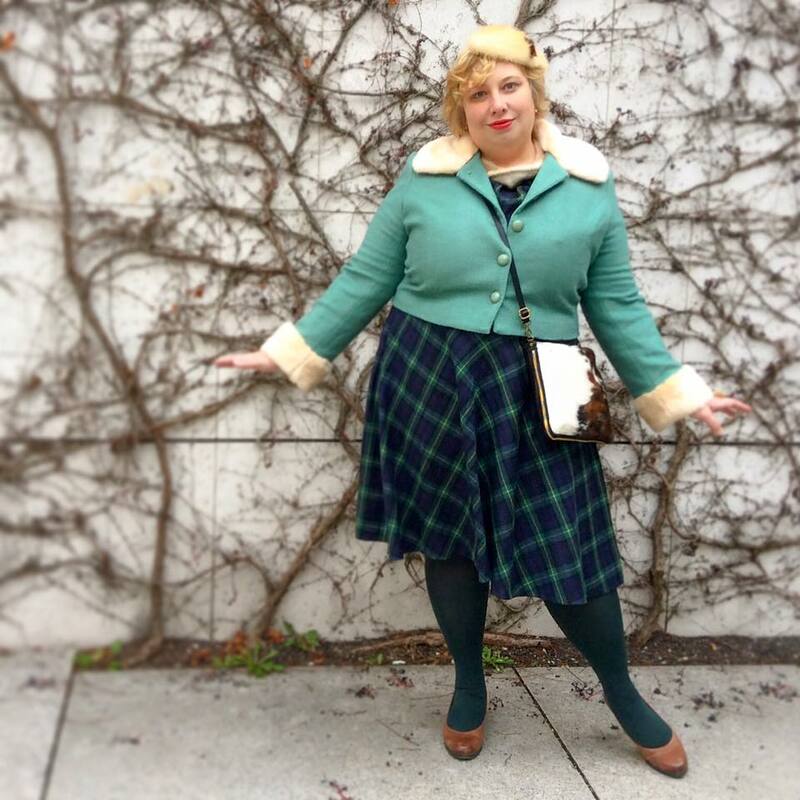 I couldn’t size up the skirt – and that is why you won’t see it on moi (at least for a while). It fits like a glove, or rather as we say in German like a saussage in skin („Wurst in Pelle“). 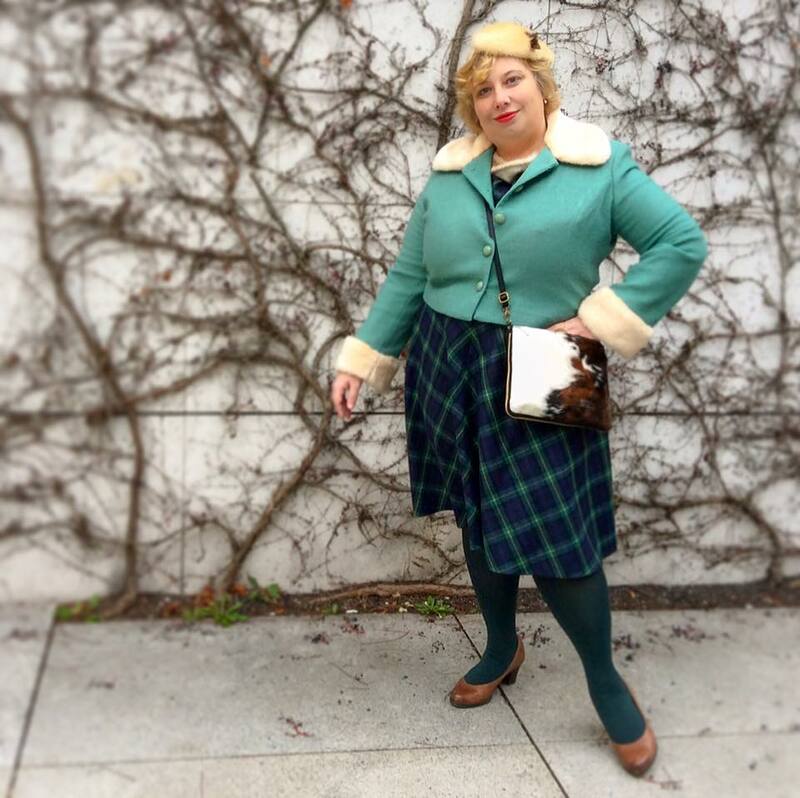 Not an extra layer – but am quite stuffed to the brim. Anyway – it is still a great jacket and looks good and wintery. The jacket is made with fake fur. 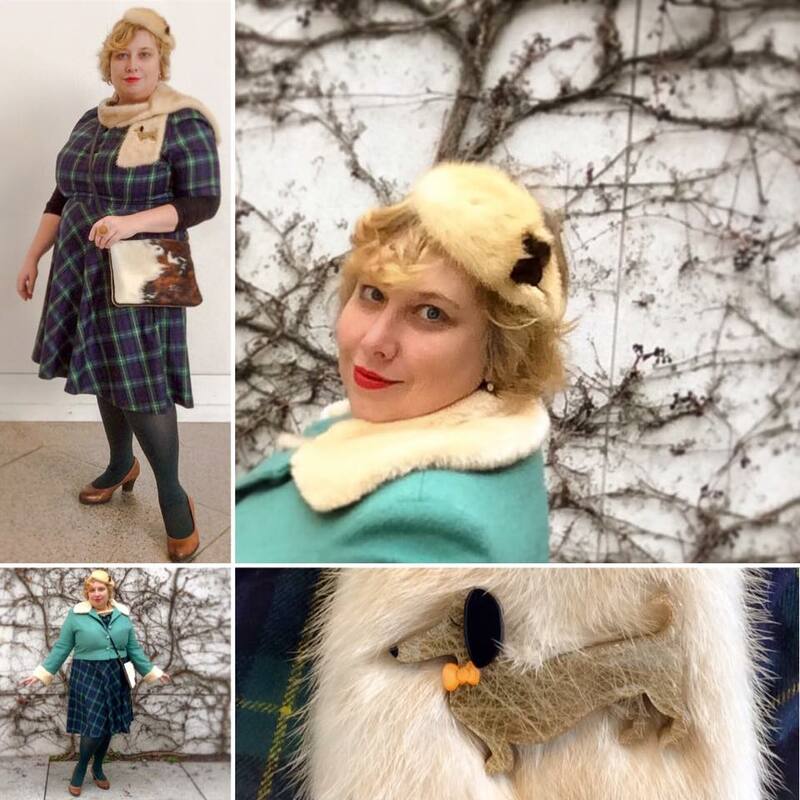 Worn here with a vintage (real) fur set. 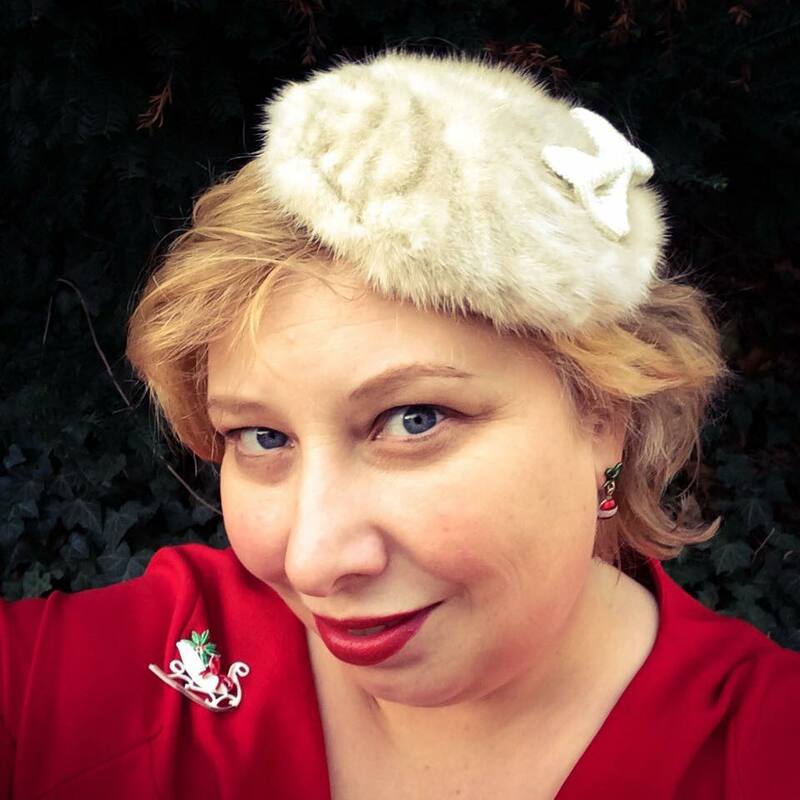 The mini hat is reclaimed mink and was a dowdy cap before I made this fascinator out of it. 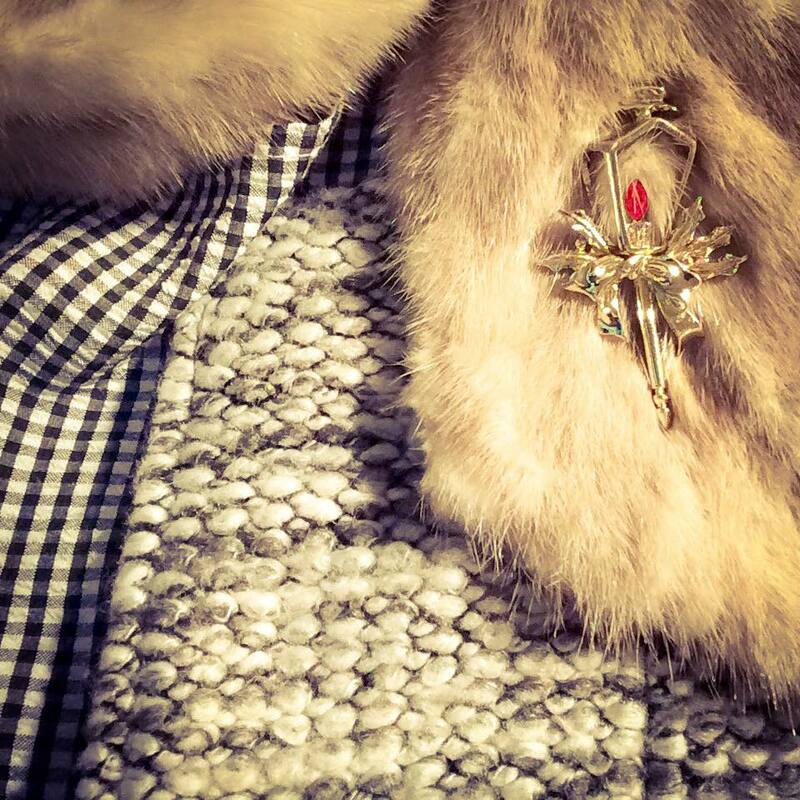 The brown inlay is a fur brooch, also dating from the 1950s or 1960s. Sorry, heute mal ohne deutsche Fassung – abgesehen bei den Bildern! 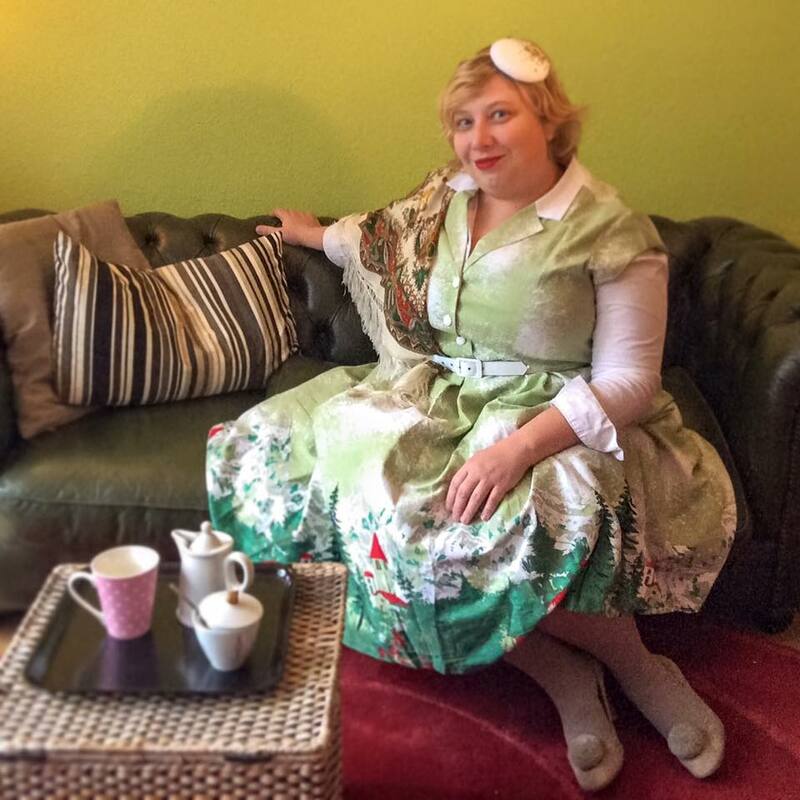 With closed eyes – but a good view of the fascinator! Mit geschlossenen Augen, dafür kommt der Fascinator gut zur Geltung. The parents and I went to the Bundeskunsthalle in Bonn – for an art exhibition. 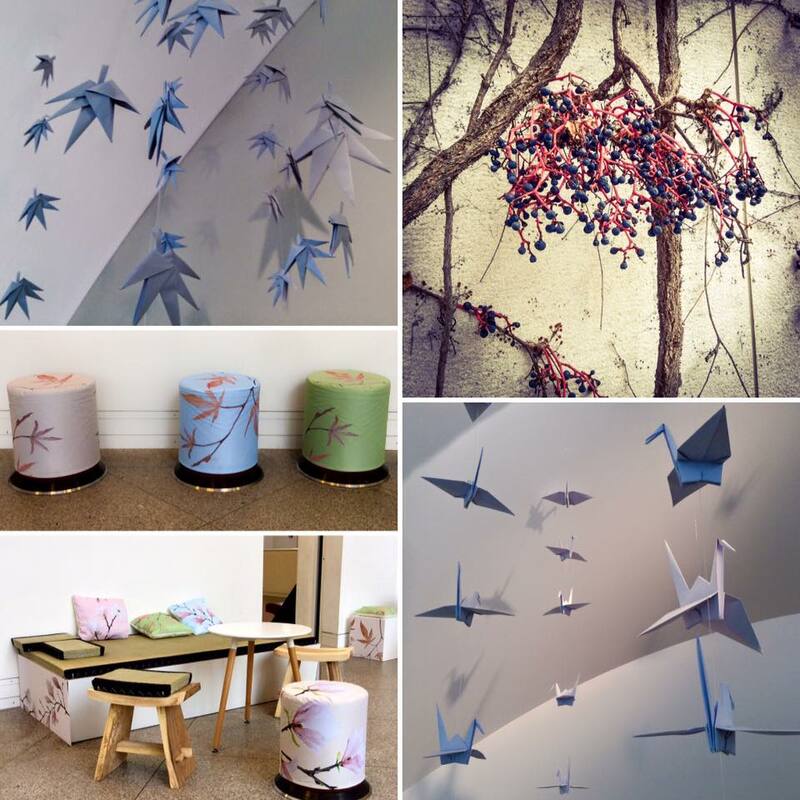 Matching the Japanese theme were the decorations in the cafe. Pics inside were not allowed. Die Eltern und ich haben eine Ausstellung in der Bundeskunsthalle besucht. Die Deko im Cafe war auf das japanische Thema abgestimmt. Bilder drinnen waren nicht erlaubt. On the way to celebrate Christmas with the family. 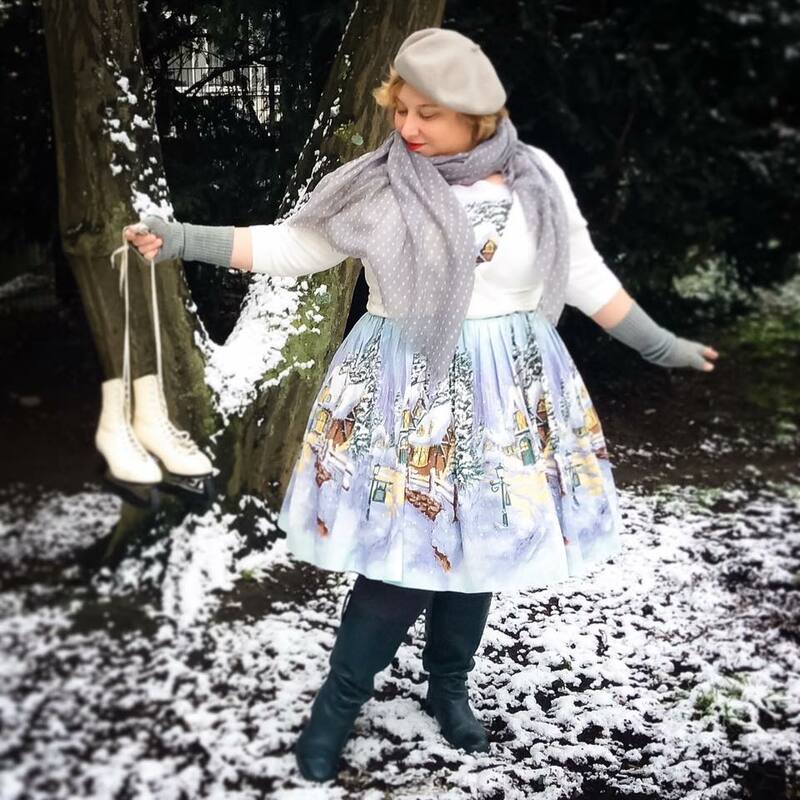 With my showstopping Bernie Dexter Winterwonderland Dress. I think I look like a Christmas angel. Unterwegs um mit der Familie Weihnachten zu feiern. 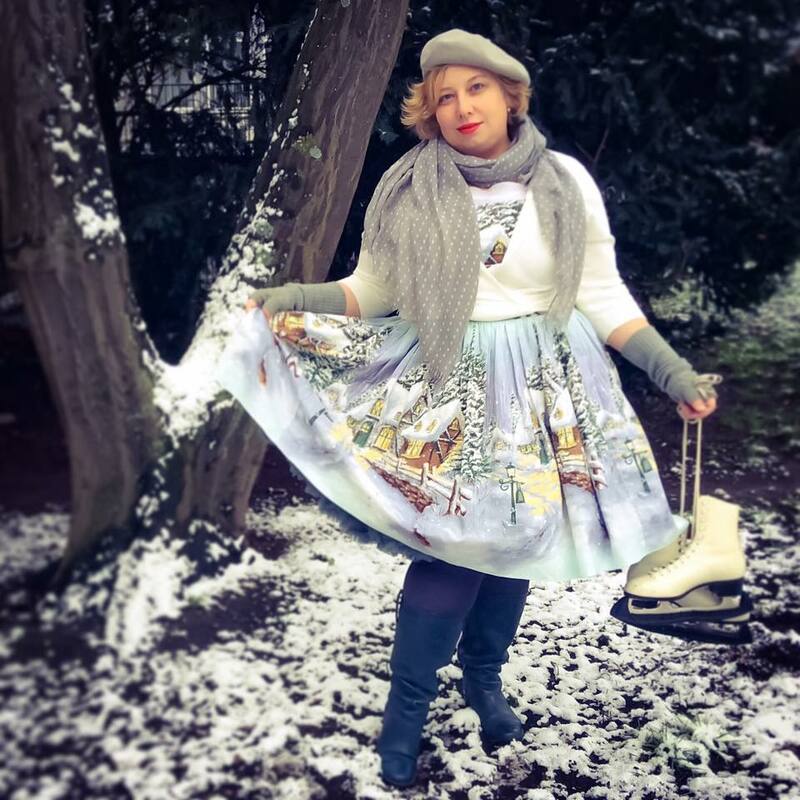 Mit meinem doch recht auffälligem Bernie Dexter Winterwonderland Kleid. Ein feiner Weihnachtsengel, oder? It twirls ranter nicely (and gives you the chance to admire the jacket in 360 degrees! Das Kleid dreht sich sehr hübsch – und so kann man das Jäckchen von allen Seiten bestaunen! Inside and outside. 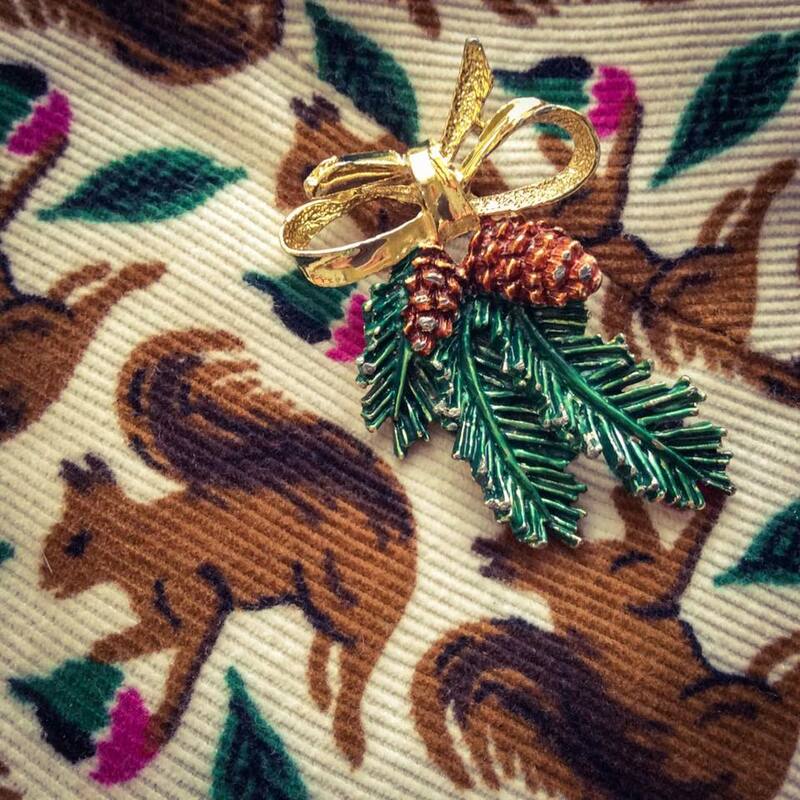 My first Erstwilder brooch – I fell in love with that saussage dog (and a few others). 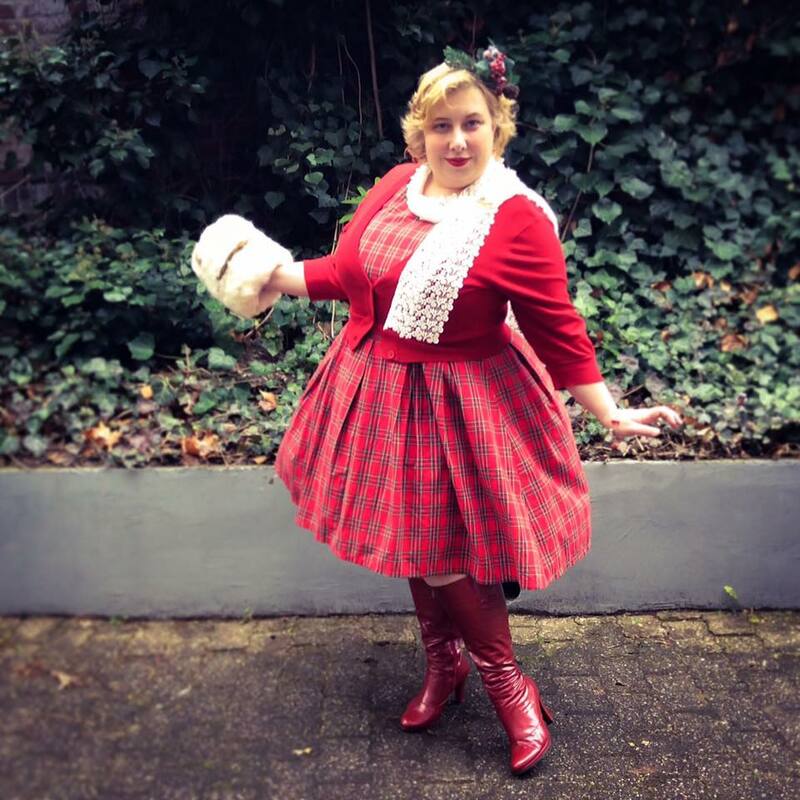 You might have recognised the dress from last year. Drinnen und draussen. Der Dackel ist meine erste Brosche von Erstwilder (und wahrscheinlich nicht meine letzte). Das Kleid hatte ich mir letztes Jahr gekauft. 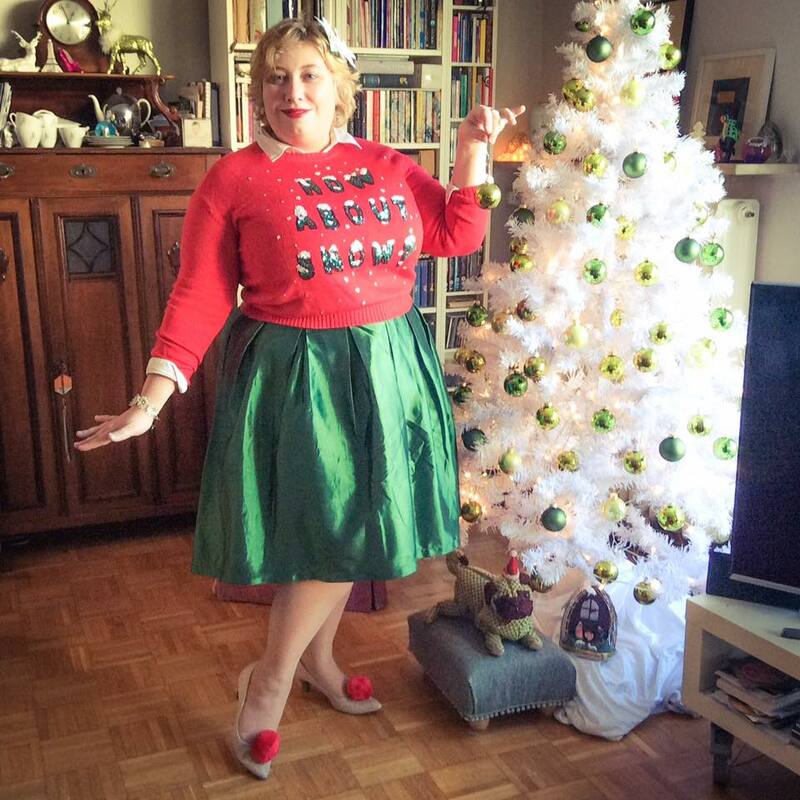 A classic in the Anglo-American wardrobe it into my closet – my very own Christmas Sweater from Collectif Clothing (also available in Brown). 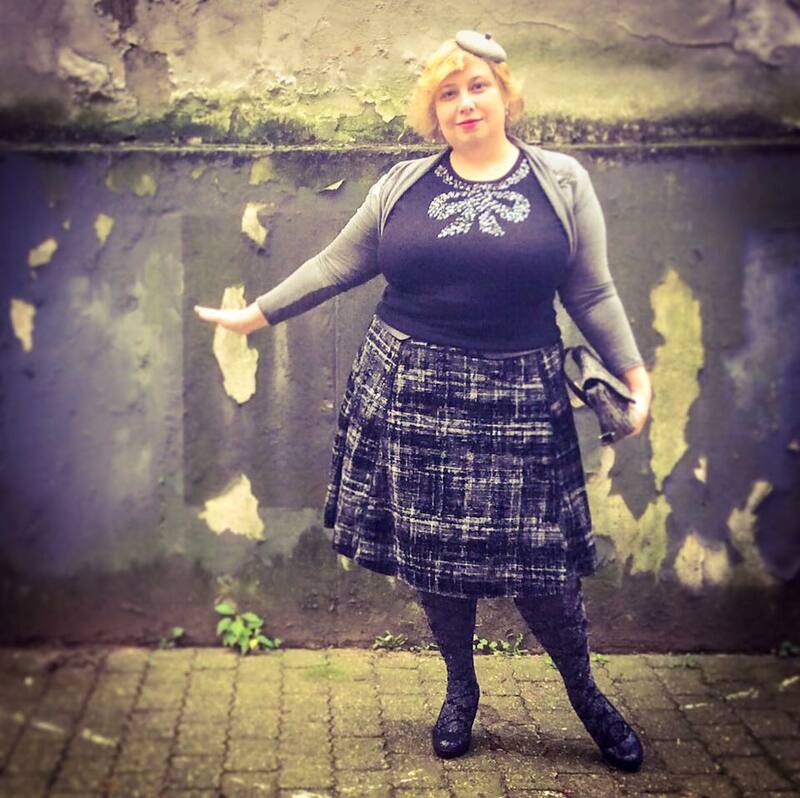 Topvintage also has these, but like with quite a few of their items not up to my size – which is a whopping 4XL. Dieses klassische Kleidungsstück aus dem Anglo-Amerikanischen Raum hat es dieses Jahr auch in meinen Schrank geschafft – der Weihnachtpullover. 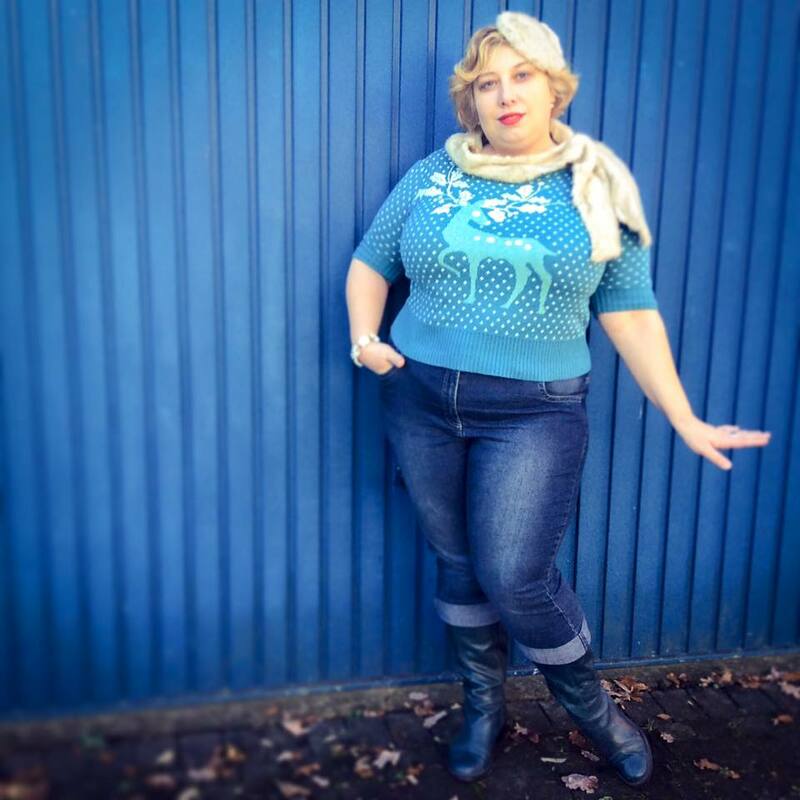 In diesem Fall Chrissie Deer von Collectif Clothing (den gibt es auch in Braun). Topvintage hat die auch im Angebot, aber wie öfters nicht bis in meine Grösse (4XL). 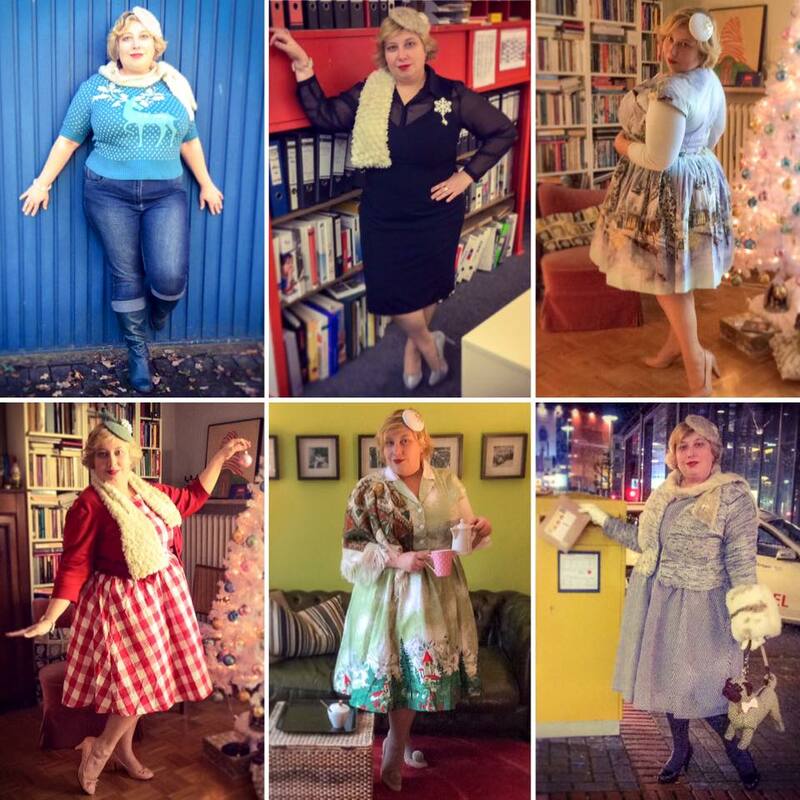 And here are all´of this year’s festive Outfits – which do you like best? Und hier sind alle diesjährigen Weihnachtsoutfits – welches gefällt euch am besten? Dommage, j’ai ni jupe ou robe de paillettes. Et j’ai aimé bien un ou l’autre en or. 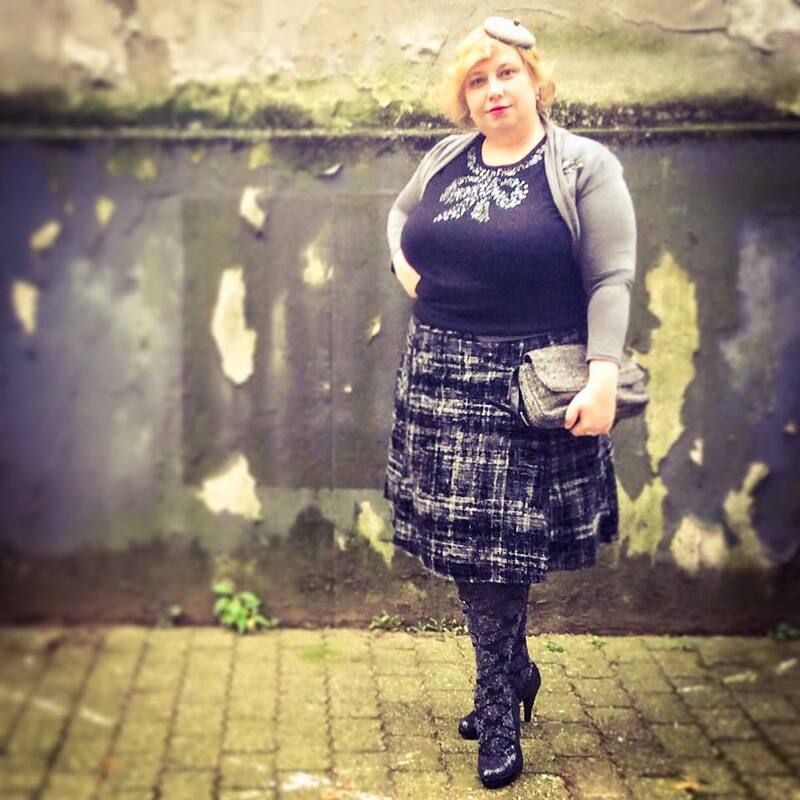 Ce que j’ai dans ma garde-robe est ce petit pull-over noir avec noeud de paillettes en noir et gris. 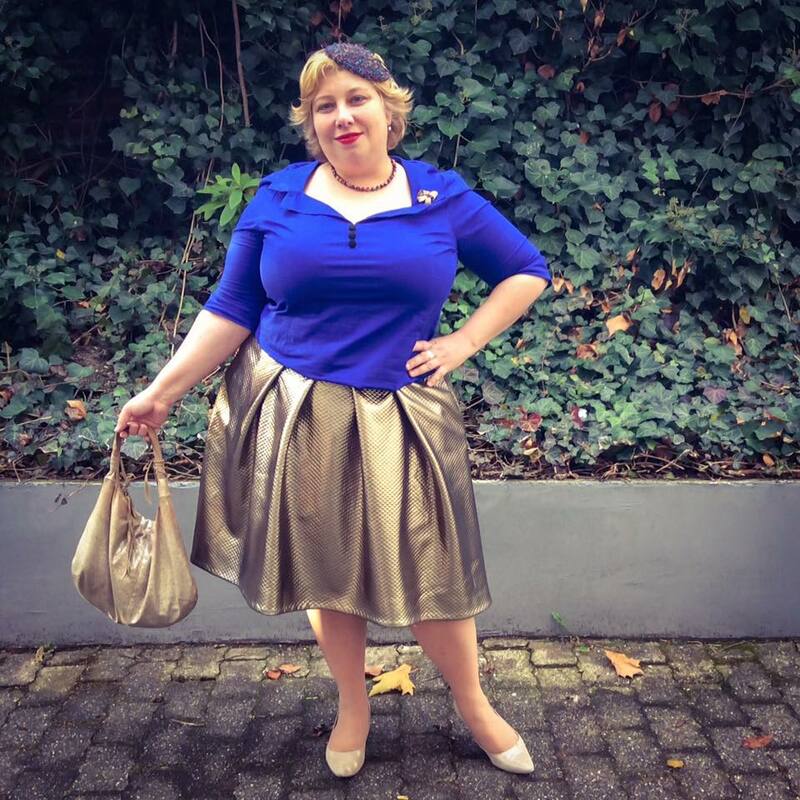 Mon look est pour un peu de brillance pour la vie quotidienne, pour une date, pour le nouvel an ou Noël entre amis ou la famille. 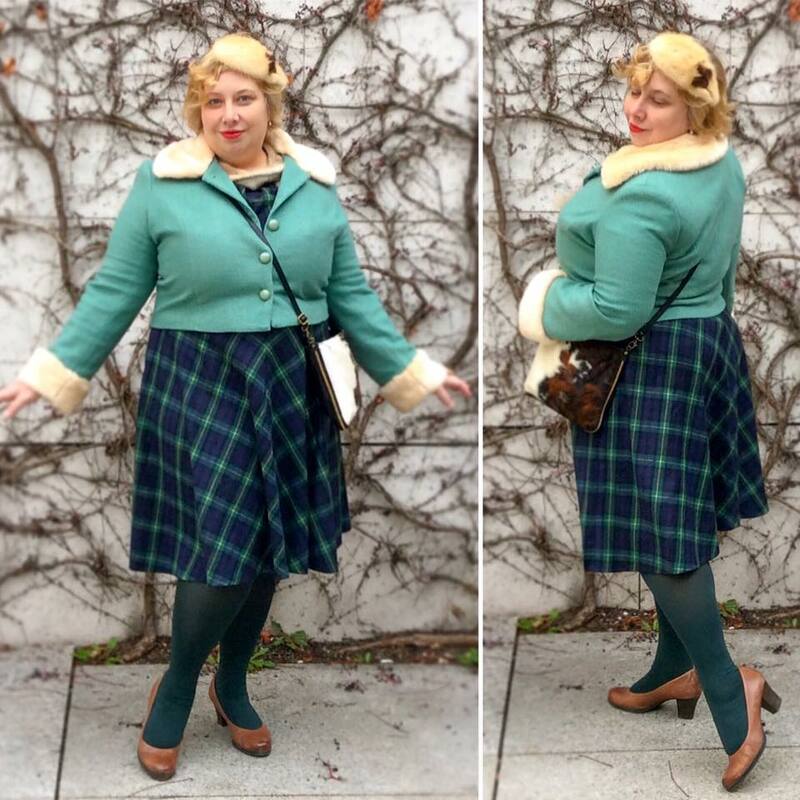 La jupe est du tweed et velours. J’aime bien la combinaison des matériaux grossiers avec les paillettes ou l’argent des collants baroques. Bugger, I neither have a sequin skirt or dress. And I’d like to have the one or the other. 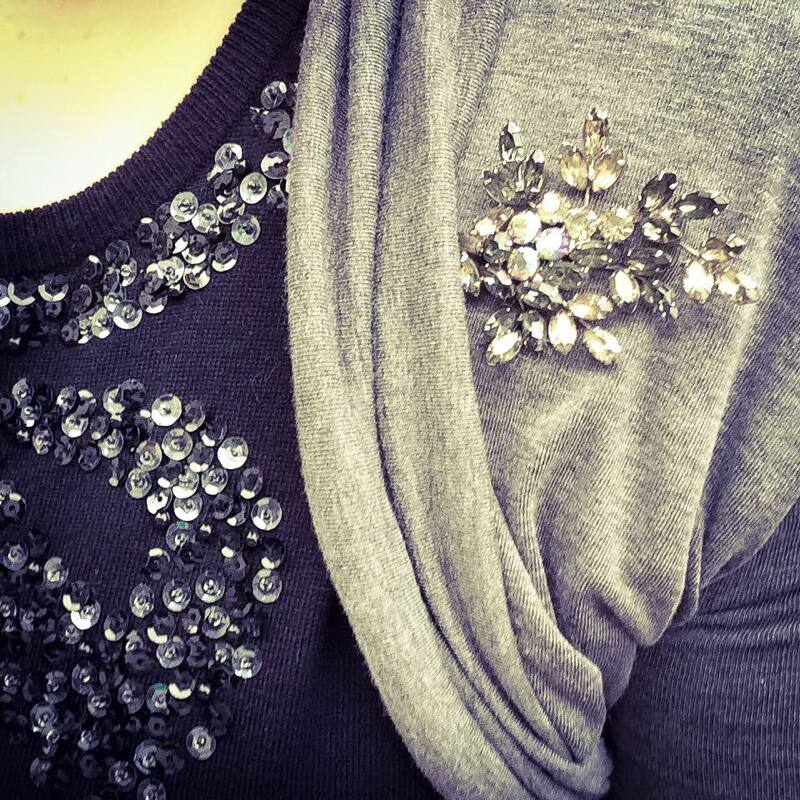 What I do have in my wardrobe is this little jumper with a black and grey sequin bow. My look brings a bit of sparkle into everyday life, to a date, a relaxed Christmas with the family or New Year’s Eve with friends. 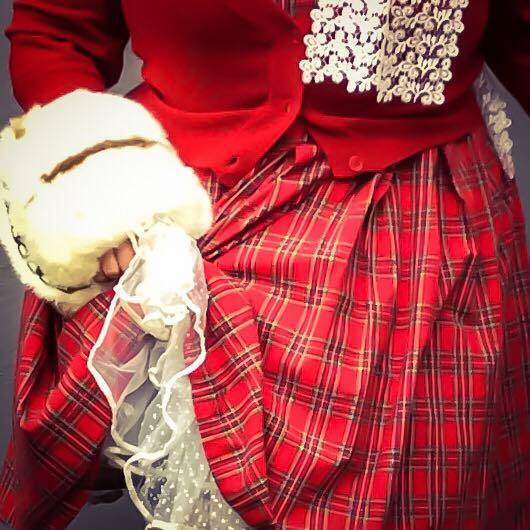 The skirt is tweed with flocked on velvet. 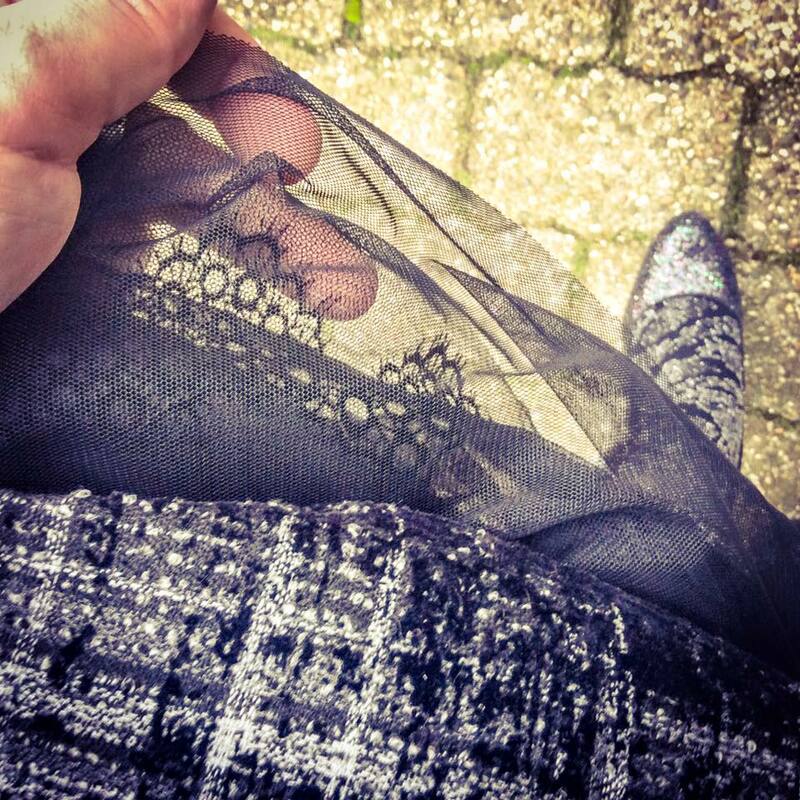 I love to mix materials, especially the coarse tweed with the shiny sequins or the silver glittering baroque tights. 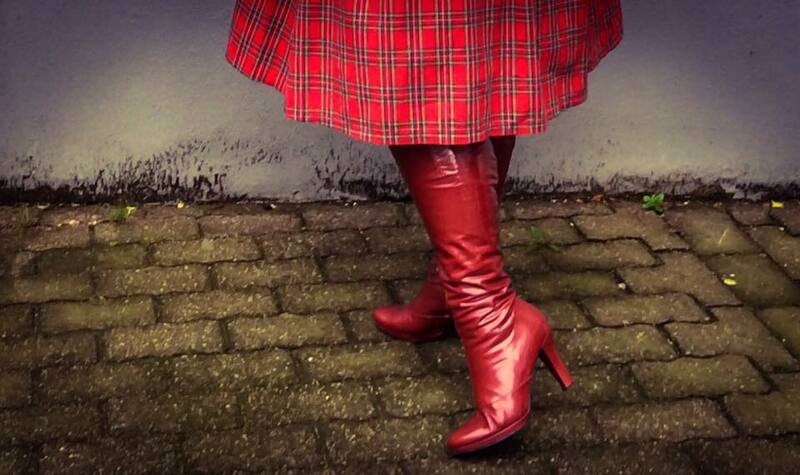 Schade, ich habe weder Paillettenkleid noch -rock. Und eigentlich fehlt meiner Garderobe auch das eine oder andere. Was ich aber darin finden kann, ist der kleine Pullover mit der bestickten Paillettenschleife in schwarz und grau. 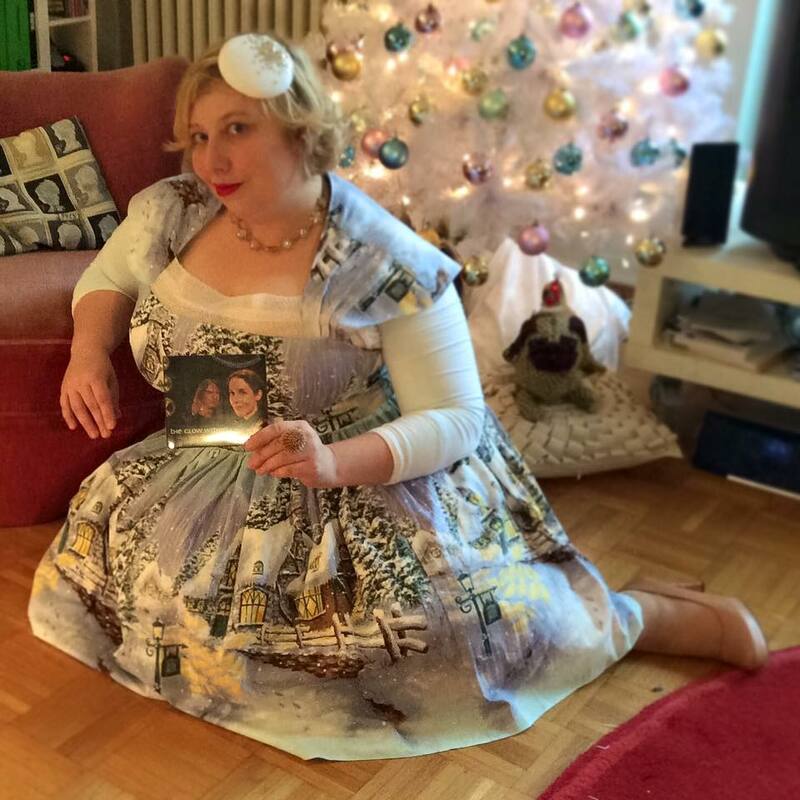 Mein Outfit bringt etwas Glanz in den Alltag, für ein Date, zu Weihnachten mit der Familie oder Silvester mit Freunden. 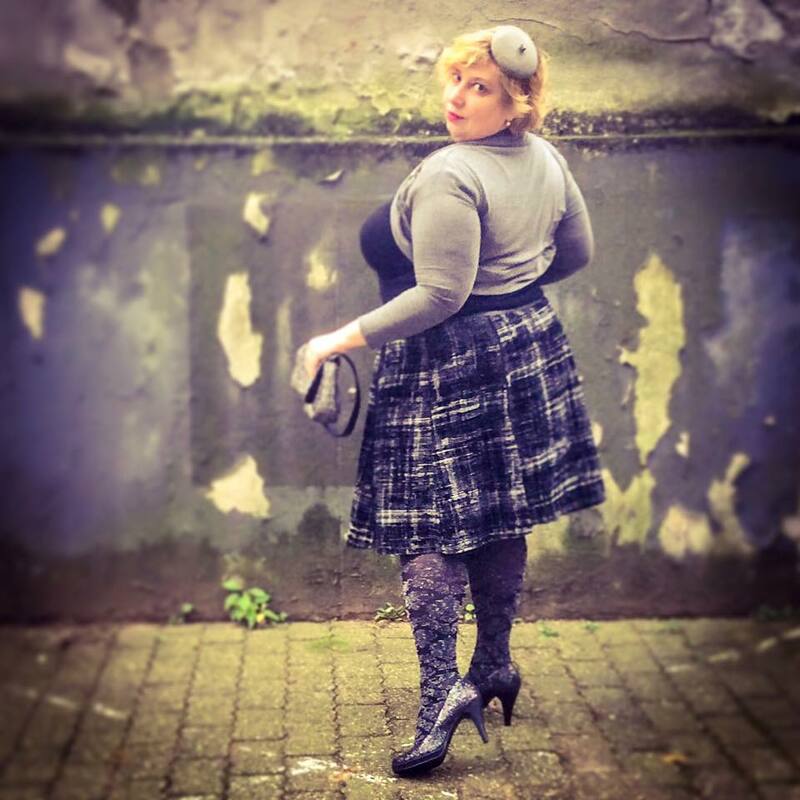 Der Rock ist aus Tweed, mit Samt bepflockt. Ich mag es Materialien zu mixen, besonders den eher groben Tweed mit den glitzernden Pailletten oder der silber schimmernden Barockstrumpfhose.